After two very tiring days, which were marked with inadequate sleep hours, I can finally get proper sleep time in a peaceful and air-conditioned room of my hotel. However, it seemed that it was still not enough. In the morning, I still felt like too tired to woke up. I felt like having a rude awakening when there is phone call. I initially thought it was a room service or just promotional call. Only after second call was made then I realize it was Hafizul! He was asking about breakfast, and I replied that it is available on 5th floor. I woke up and looking out to window. As a railway enthusiast, I feel very grateful that I have chosen the right hotel and right room to stay. 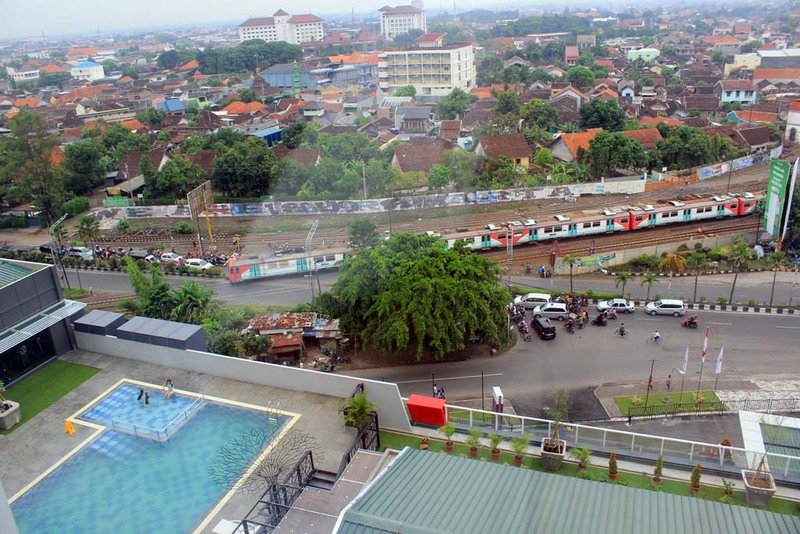 Just by sitting on the bed I could see the railway station below clearly. 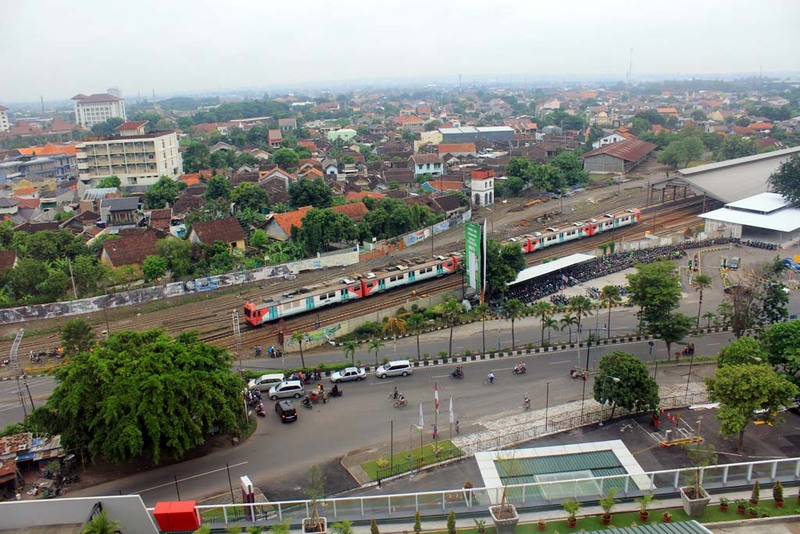 I could even see the passing Prambanan Express train easily from my room window. After having shower, I head to the hotel’s restaurant to have a breakfast. Apparently both Waktong and Hafizul haven’t come yet. 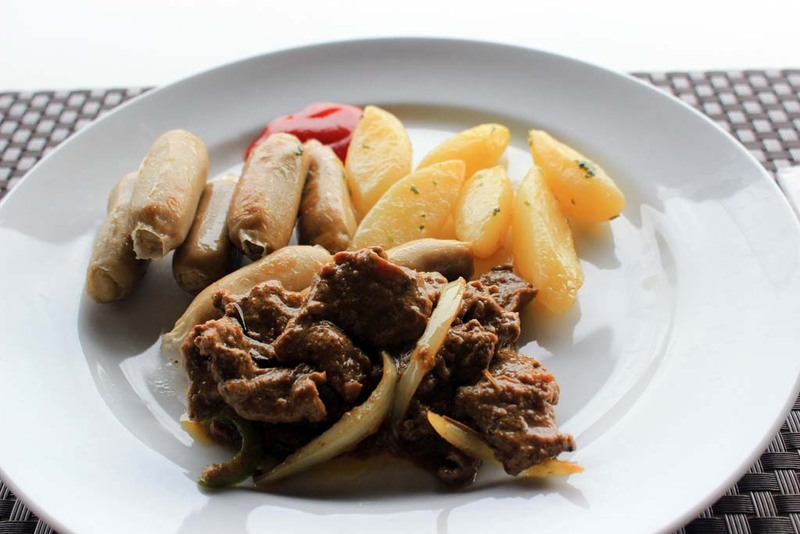 I took my first portion which consists of Beef Stroganoff, grilled sausages, and grilled potatoes. 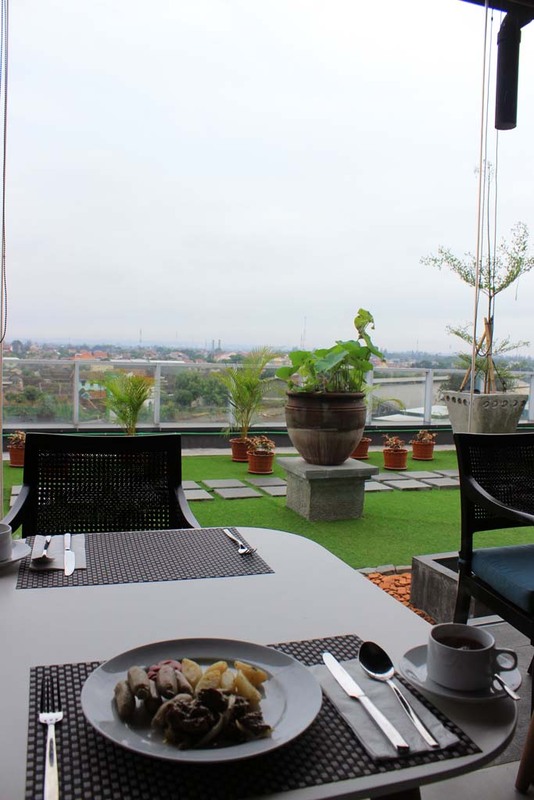 I have to admit that this is an excellent place to have breakfast. Moments later, Waktong and Hafizul arrived and start to have breakfast. 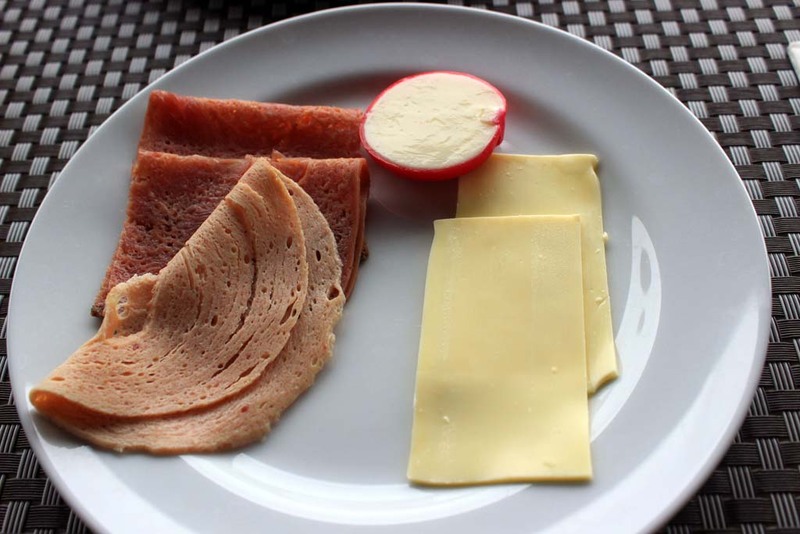 Meanwhile, I took my second portion which consists of cold cuts and cheeses. Then I took the salad. Unfortunately, the corn tasted a bit sour. I was initially expecting sweet corn. 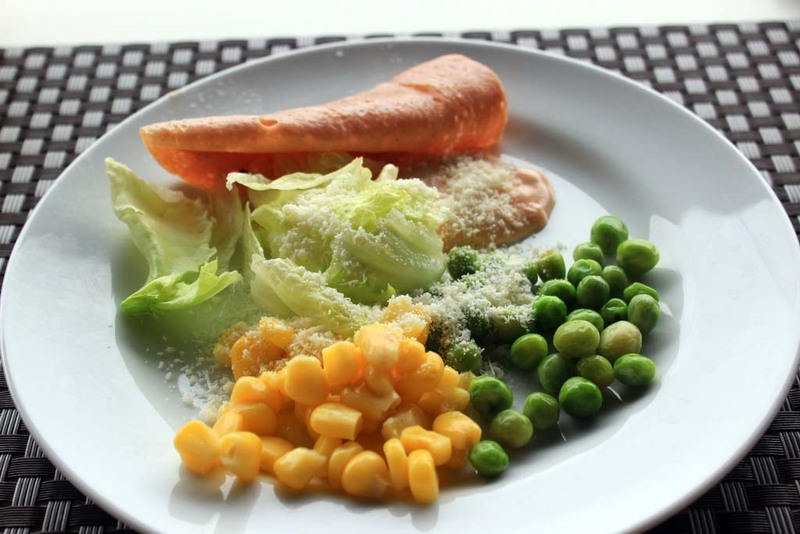 The peas were also equally unappetizing. 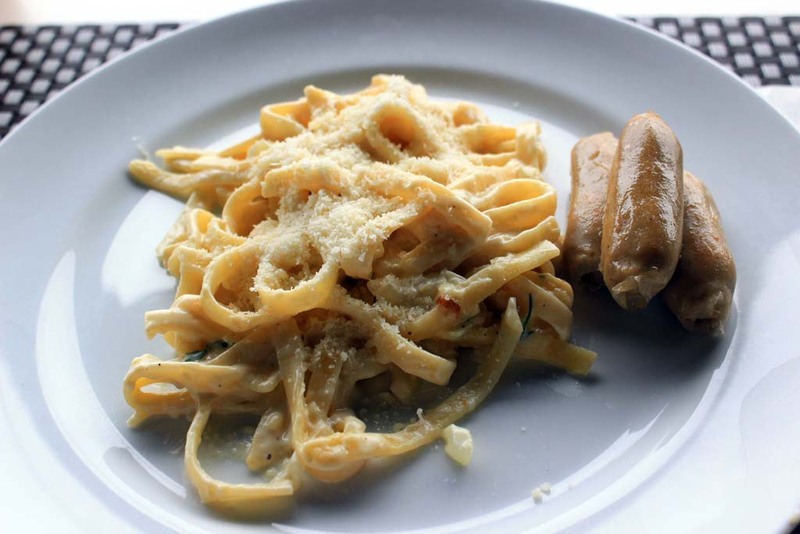 Then I took the next portion which consists of grilled sausage and fettuccini carbonara. The fettuccini tasted excellent! I love the cheese flavor. 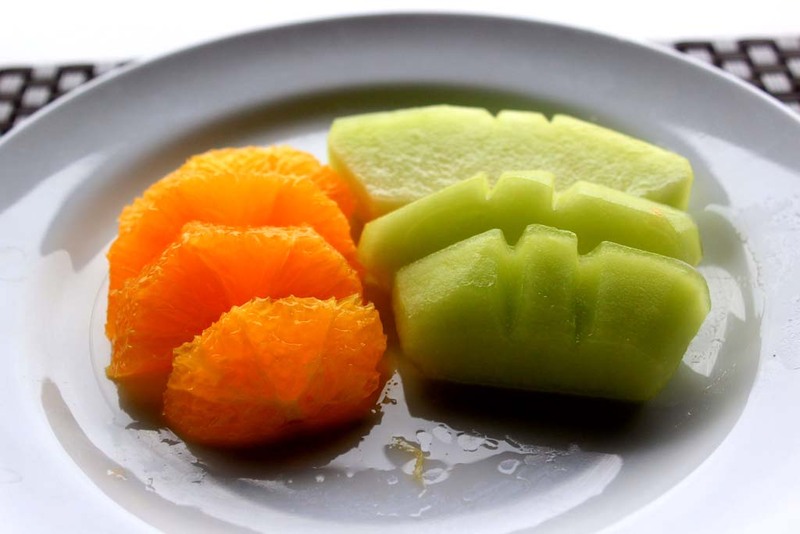 And finally the fruits for the dessert. 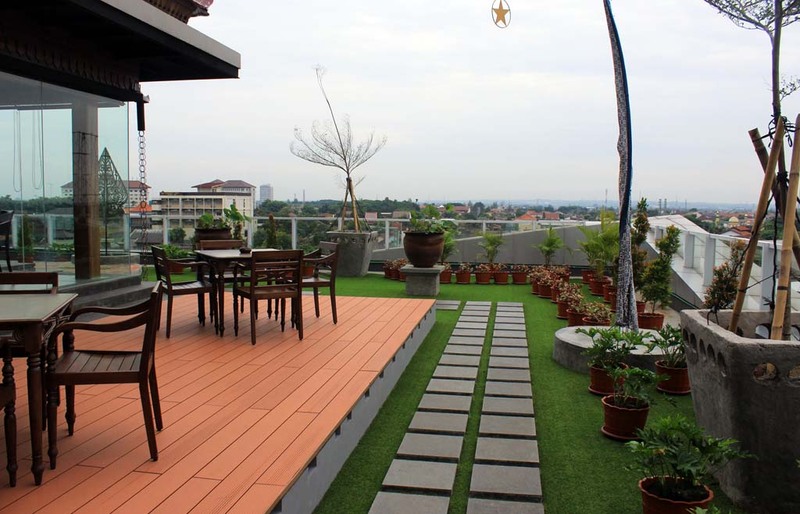 After completing the breakfast, we went out to enjoy the garden. For some reason, they’re using fake plastic grass, instead of real one. I’m not sure why is that. At least other vegetation are real. 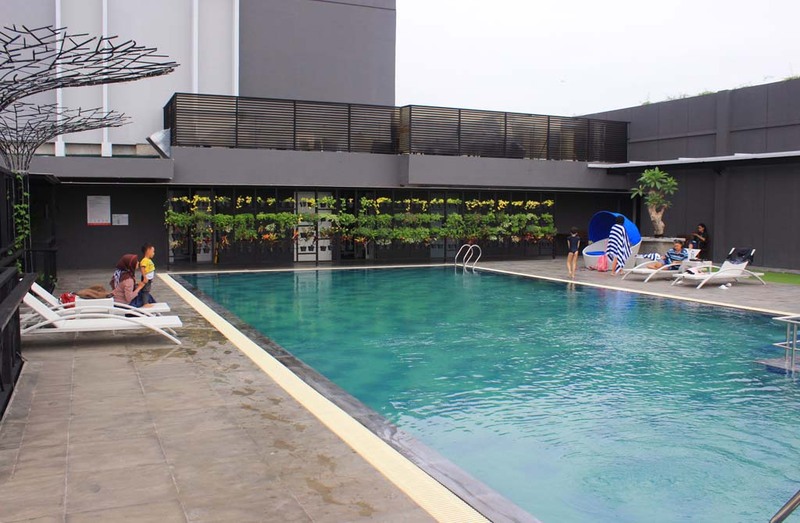 The swimming pool is just a basic swimming pool that you would normally found on a 3-star hotels. 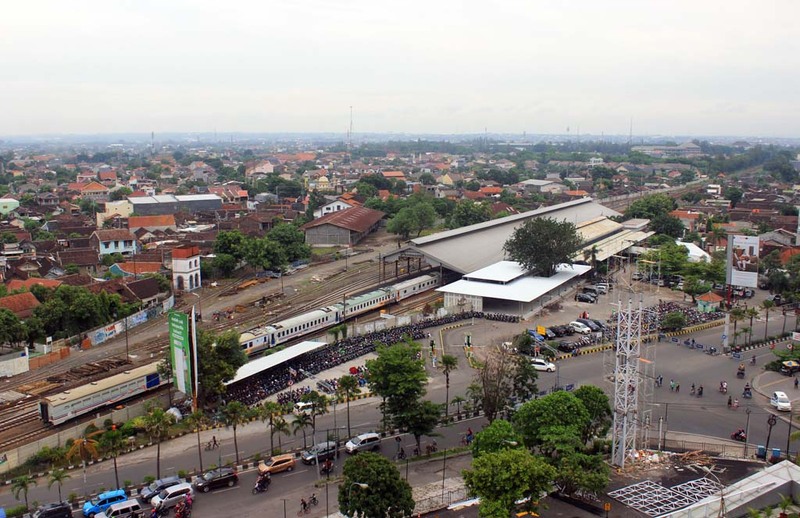 But from here, you can get commanding view of Solo Purwosari station. 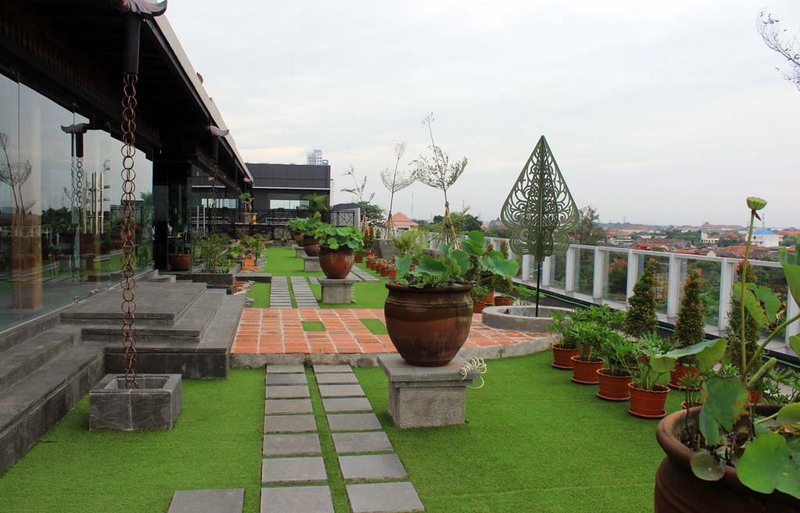 We still enjoy our time in here, while I would like to explore the rooftop garden more. Well, I’m sure that this gonna be a perfect picnic spot. Look can be deceiving here. 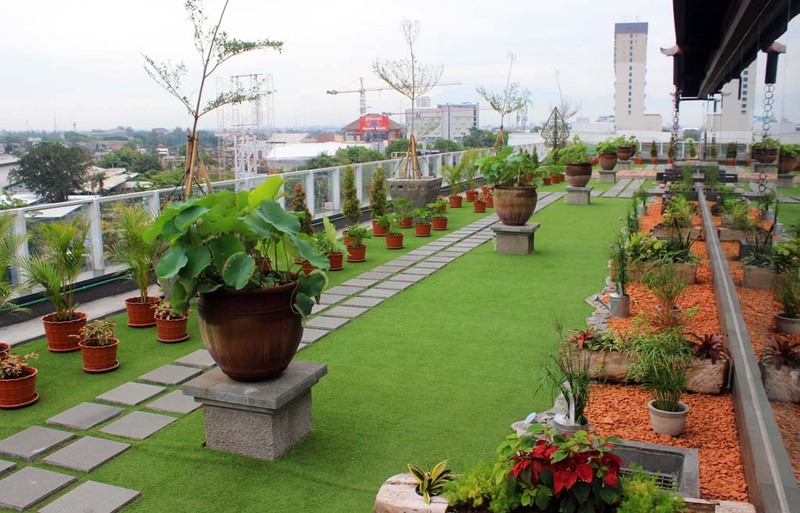 Despite of its lush greenery, the grasses are none other than just a plastic green carpet! 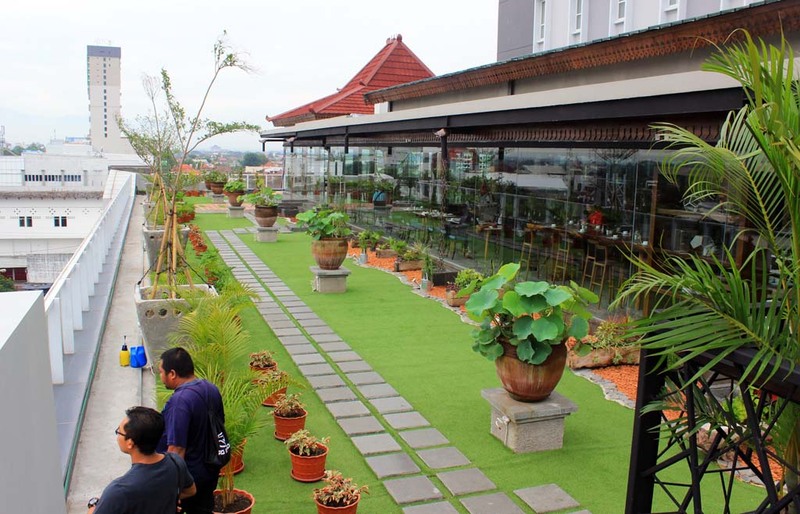 Since this hotel is located in Solo, which is known as one of the most important Javanese cultural centre, the hotel owner decided to add “Pendopo” on its rooftop garden. 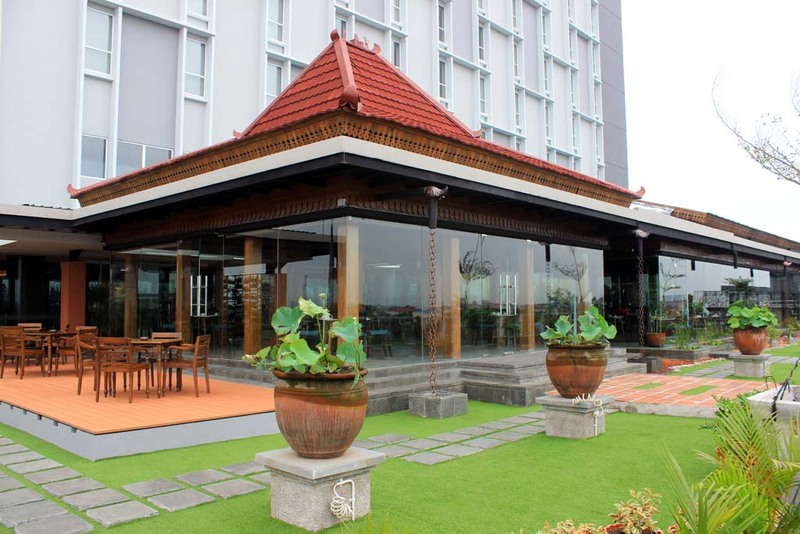 Pendopo is a Javanese style guest hall, where it is normally used to receive guests or where the host uses to discuss with his/her guests. 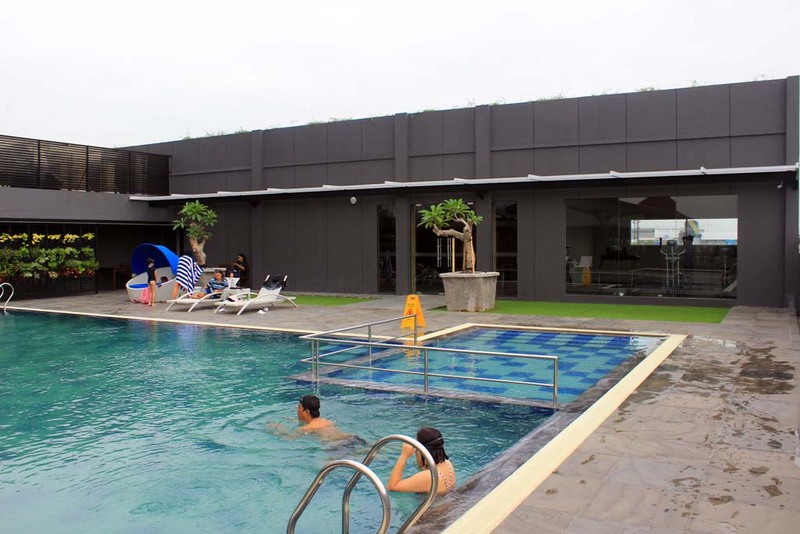 But somehow, this Pendopo looks out of place when compared to the hotel’s architectural style. We head back to our room to prepare our cameras. Along the way I took the photos of its stylish lounge and ballroom hall. 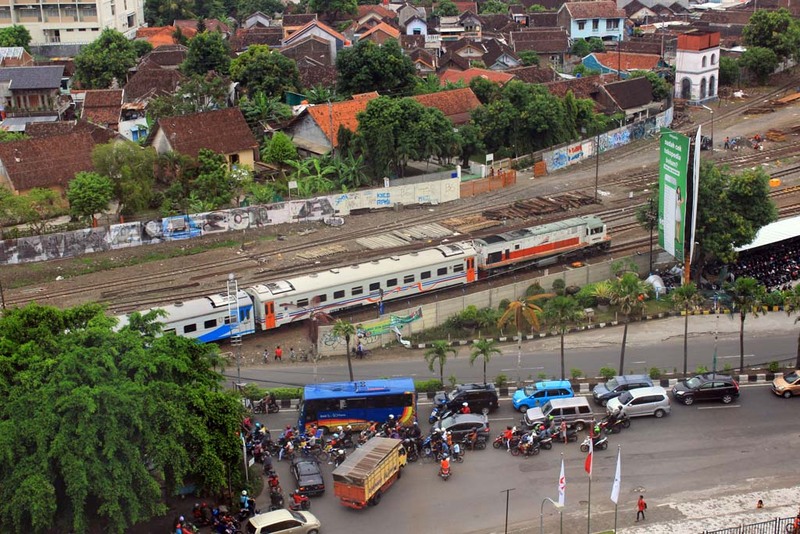 While I was preparing my camera and equipment, I caught the glimpse of passing Malioboro Express train that travel from Yogyakarta to Malang. 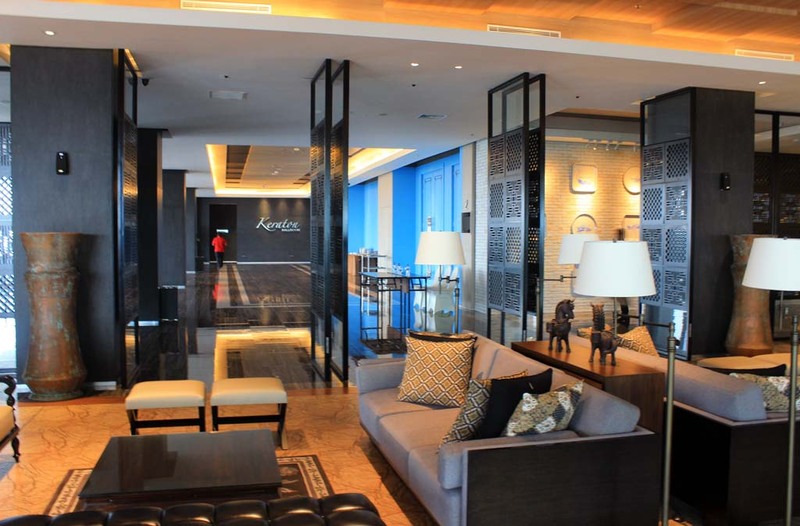 After taking my belongings I went to the lobby, where I meet both of them. It was around 09.15. I have actually booked a car hire (with driver and petrol). According to initial plan, it supposed to arrive at 9am. But it still haven’t arrive yet. Rather than complaining we decided to go to the nearby street running section at jalan Slamet Riyadi. 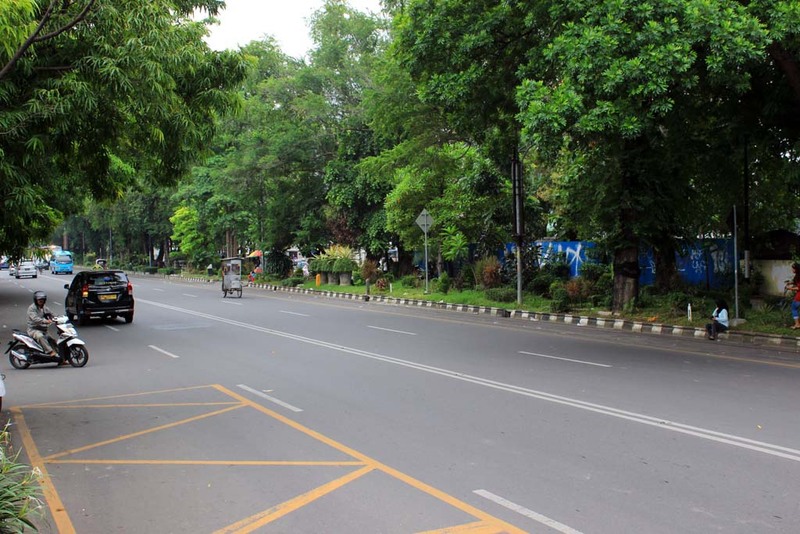 This street running section is one of a very few street running section still remain in operation in Indonesia. 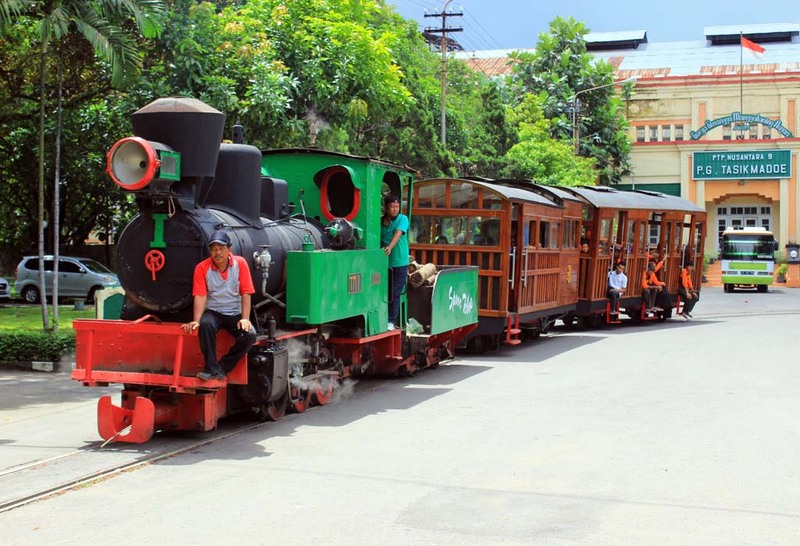 Back in the old days, the service were normally served by decrepit economic class train, hauled by small locomotives. 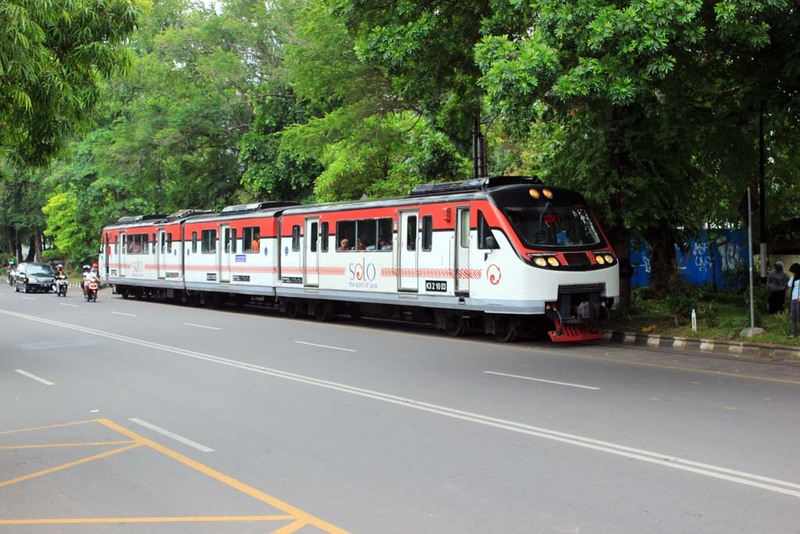 But since 2012, it was upgraded into an air conditioned Batara Kresna DMU. 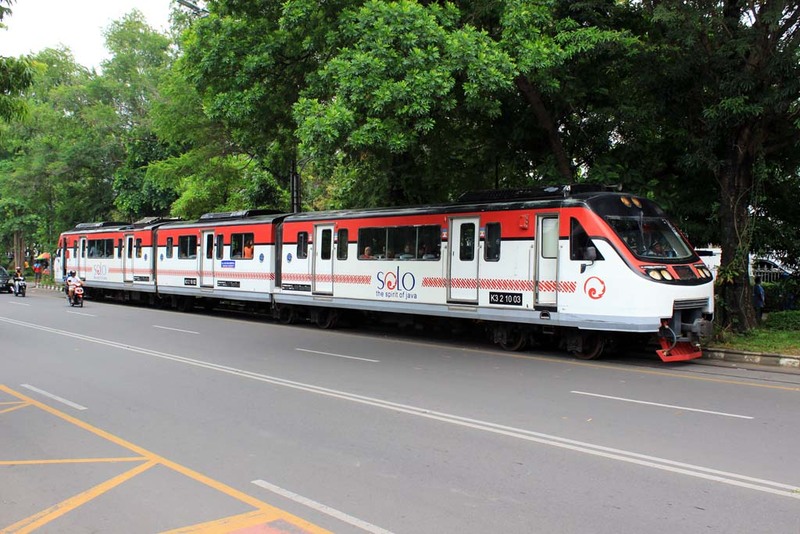 The contrasting sight of a train traveling peacefully with road vehicles have become rarity in Indonesia, and Solo is the last place to see such thing. 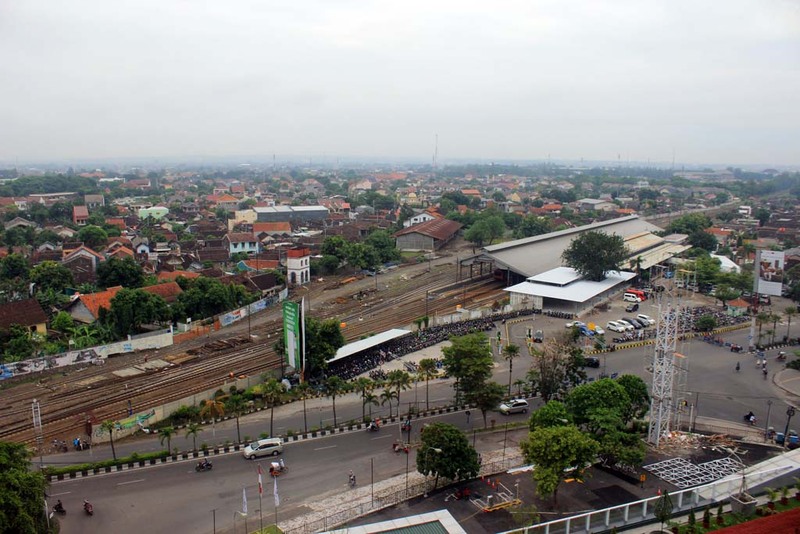 As the train slowly moved away into Solo Purwosari station, I decided to pack my cameras and ready to head back to the hotel to meet the driver. 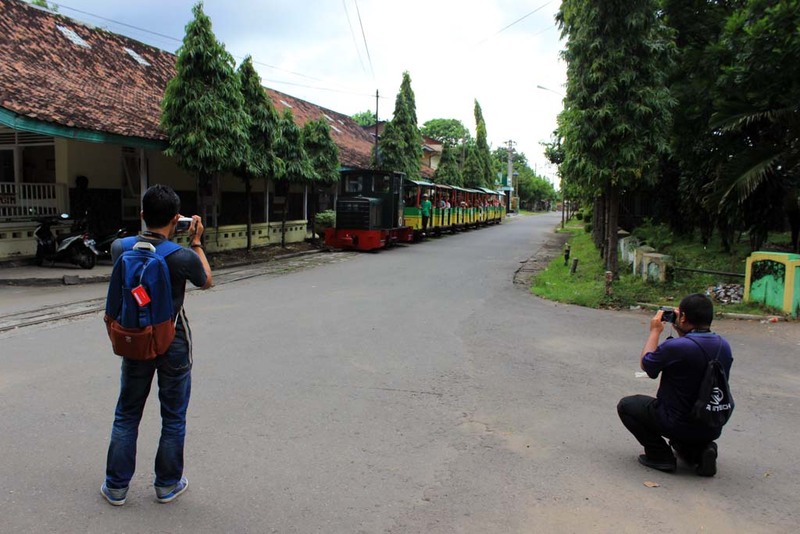 Waktong and Hafizul decided to stay and want to photograph the Batara Kresna train on its return trip to Wonogiri. So I decided to head back to the hotel alone to catch up with our hired car. As soon as I made it back to the hotel, I was greeted by the driver of our car. 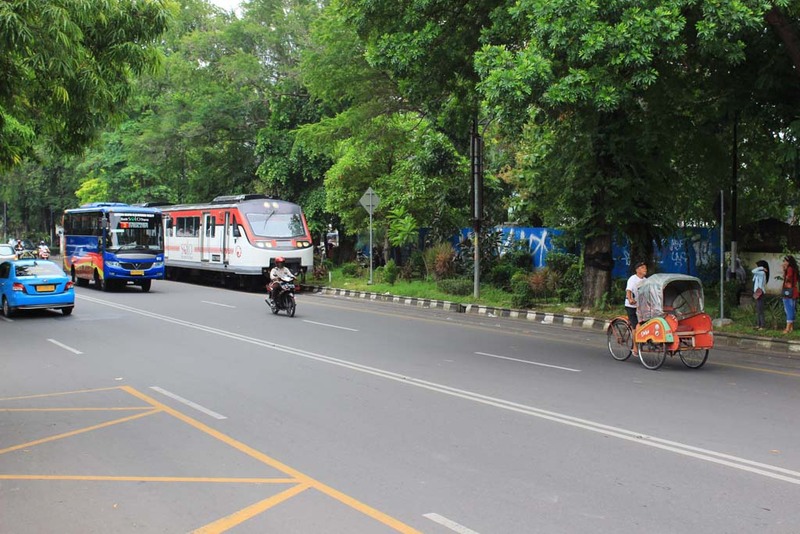 He apologized for his lateness because apparently while attending a Car Free Day event he received additional impromptu orders. I accepted his apology, and once I put all of the bags in the boot, we went to jalan Slamet Riyadi to pick Waktong and Hafizul up. 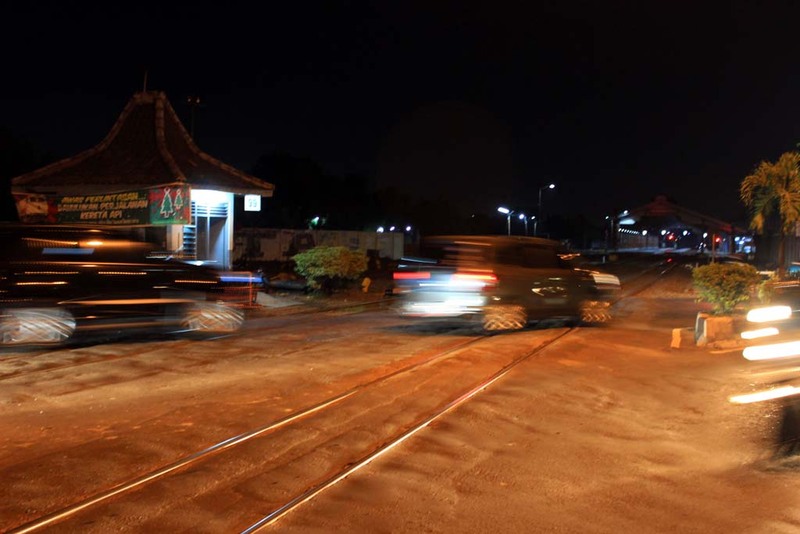 Both of them are apparently waiting at the level crossing of Wonogiri branch, right at the starting point of street running section. Once they boarded the car, we resumed our journey to Tasikmadu. 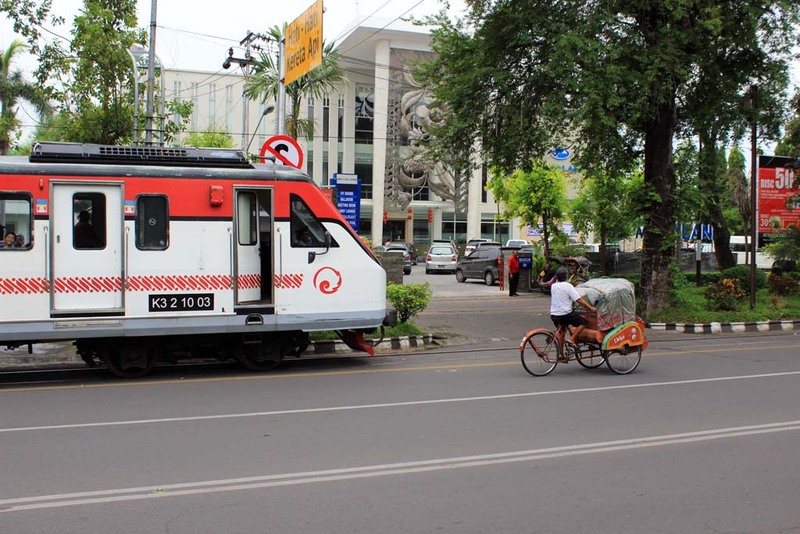 As we plying jalan Slamet Riyadi, apparently we caught up again with the Wonogiri-bound Batara Kresna DMU. 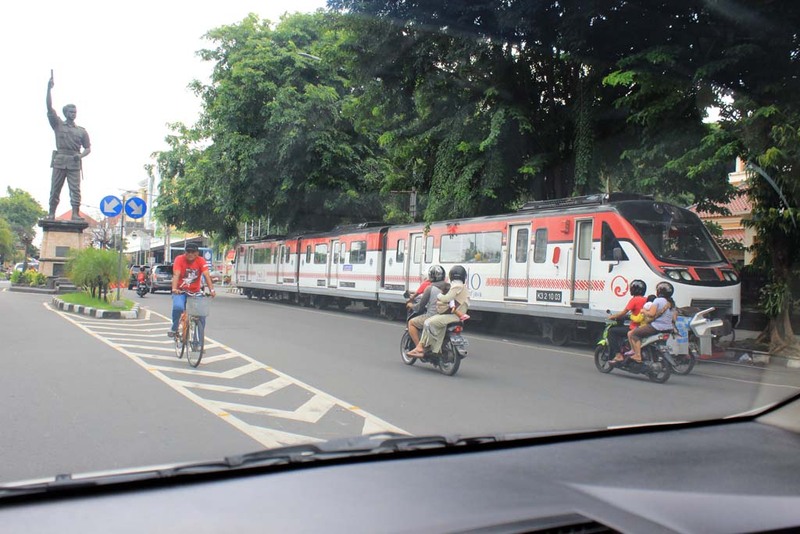 Waktong asked the driver to overtake the train. But apparently it won’t be that easy. 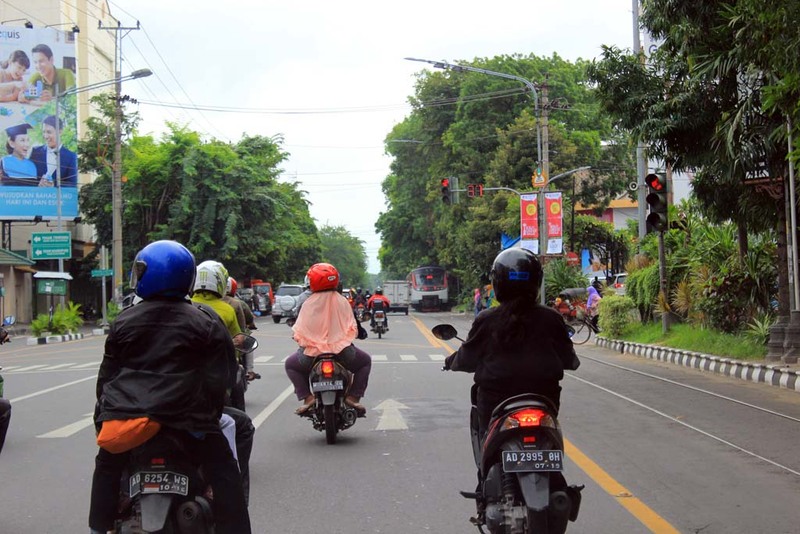 Because whenever we encounter traffic lights, they’re always turned red. 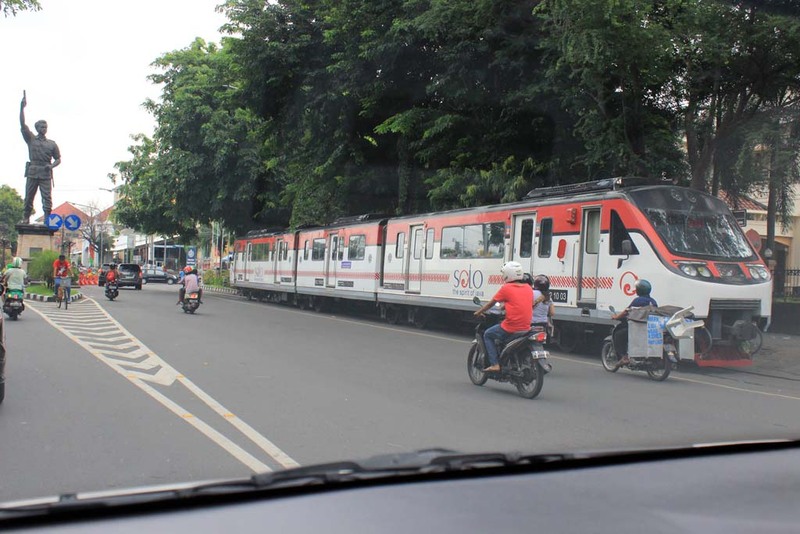 While on the other hand, the train is exempted from following the road traffic rule. 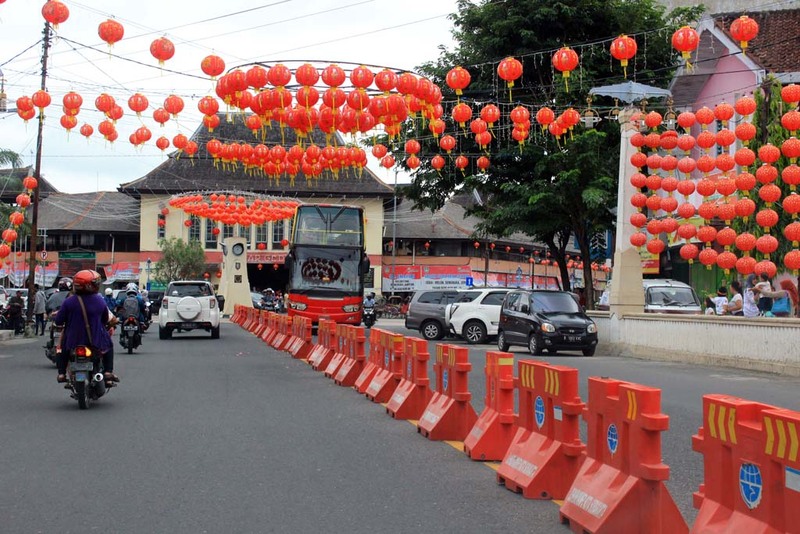 A cheeky driver might want to run the red light, but not before being fined by traffic police! 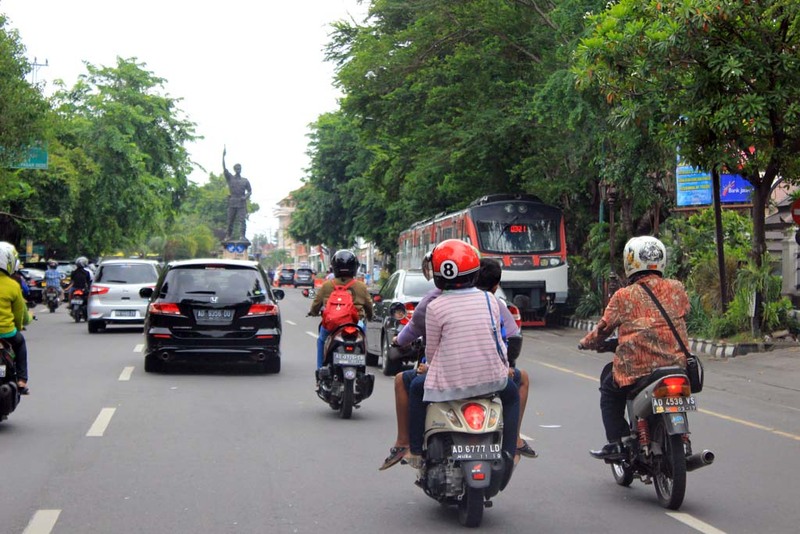 As the train approached Slamet Riyadi statue, it is the beginning of the end of street running section, and we had to bid farewell to the train for today. 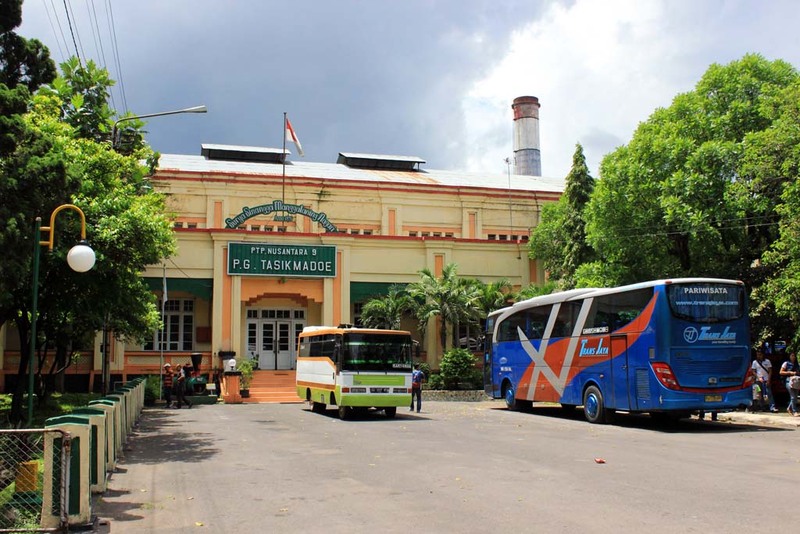 When we traveled near the famed Pasar Gede market, we came across an unique double decker bus. 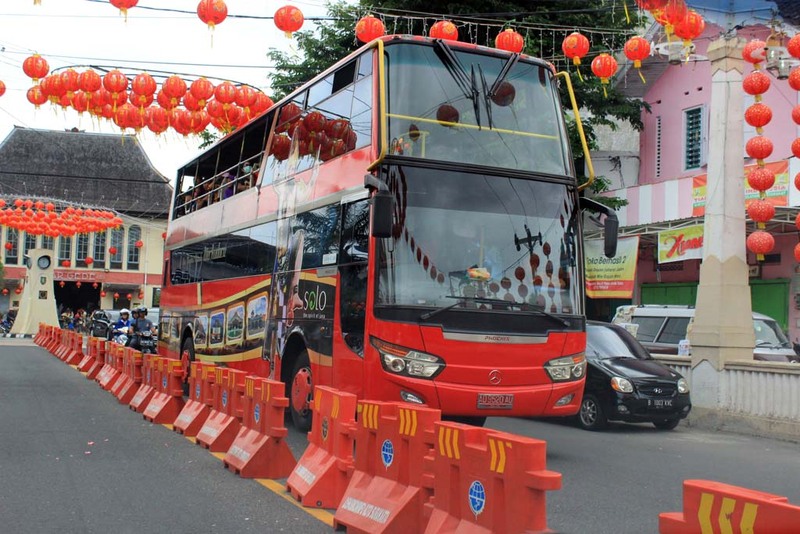 This tourist bus service was inaugurated during Jokowi’s mayoralty and proved very popular amongst the visiting tourists in Solo. 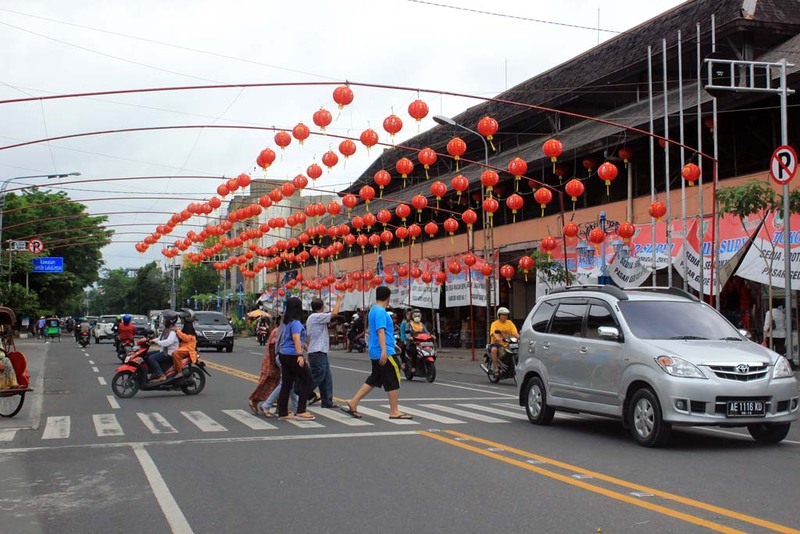 It’s the Chinese New Year eve, and apparently everything have been prepared for the festivity. 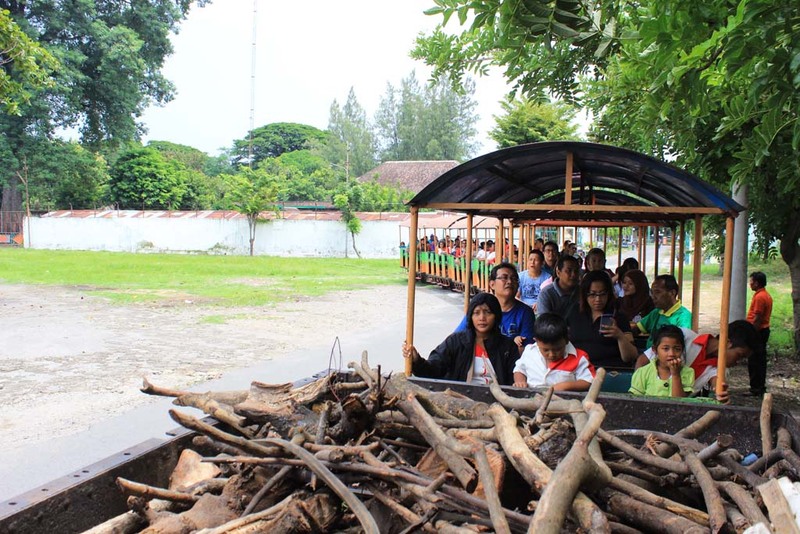 After several minutes driving, we finally arrived at Tasikmadu sugar mill. This grand looking mill was originally founded by one of the Solonese royal families. 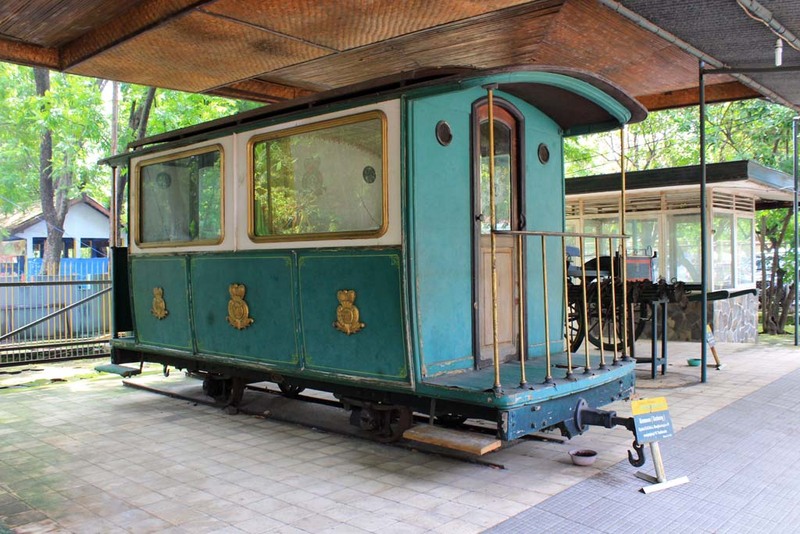 Right next to its entrance door you can see one of the former Royal inspection coach displayed. 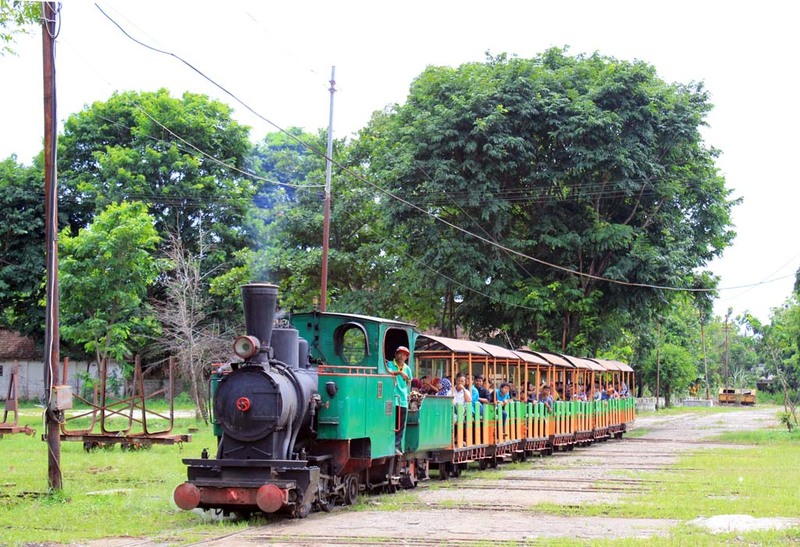 Built to 750mm gauge track, this coach was once used by the Royal family owner to inspect their vast sugarcane estate by traveling on Tasikmadu’s narrow gauge field lines. Of course the grandeur days of Royal visit to Tasikmadu have long gone. The internal dispute within the Solonese royal family, economic crisis, and poor space planning have reduced this once behemoth mill into an over-sized struggling mill. Even the once vast sugarcane estate have largely been converted into either rice field or built up areas. 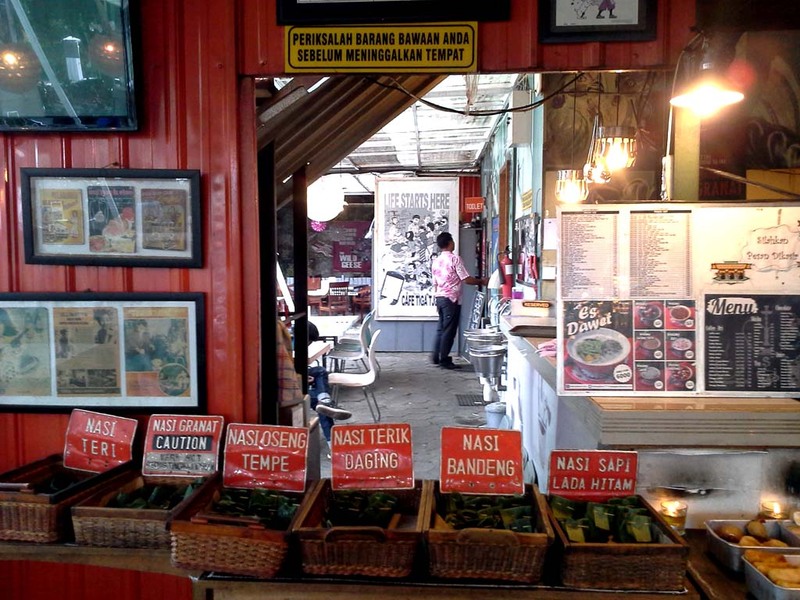 All of Tasikmadu’s field lines were closed at the conclusion of 1993 harvesting season. 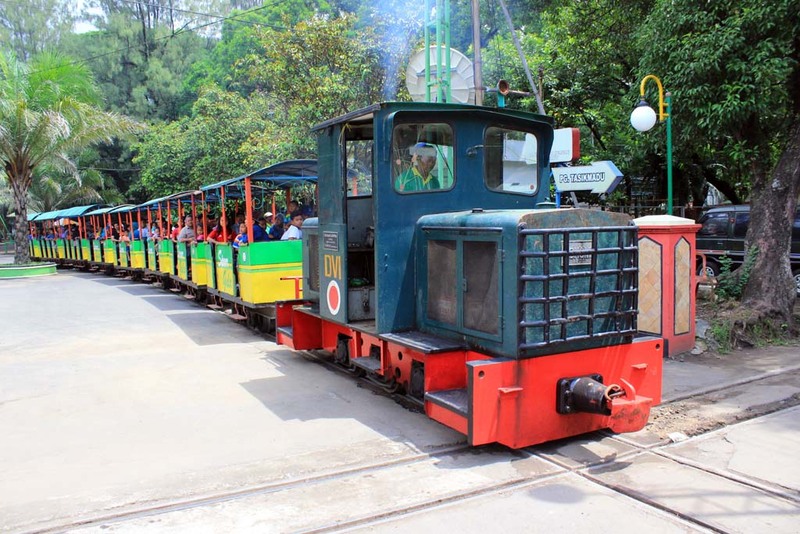 Now locomotives are used mostly for shunting. 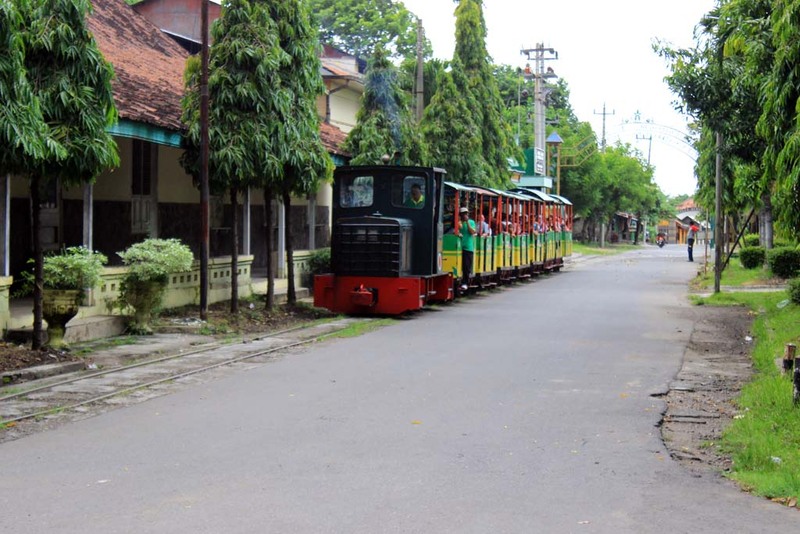 But since 2007, they have also been used to haul recreational train that plying newly laid tracks around the mill. Moments later we hear a sound of whistle. It sounds like steam whistle, but rather weak one. 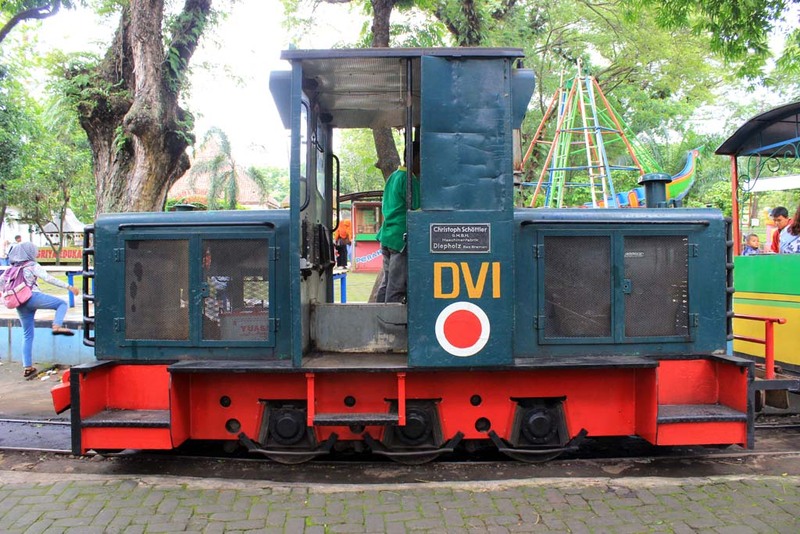 It turned out that it actually came from a diesel loco. What a surprise! This is the first time I see this Diema loco working since 2012. 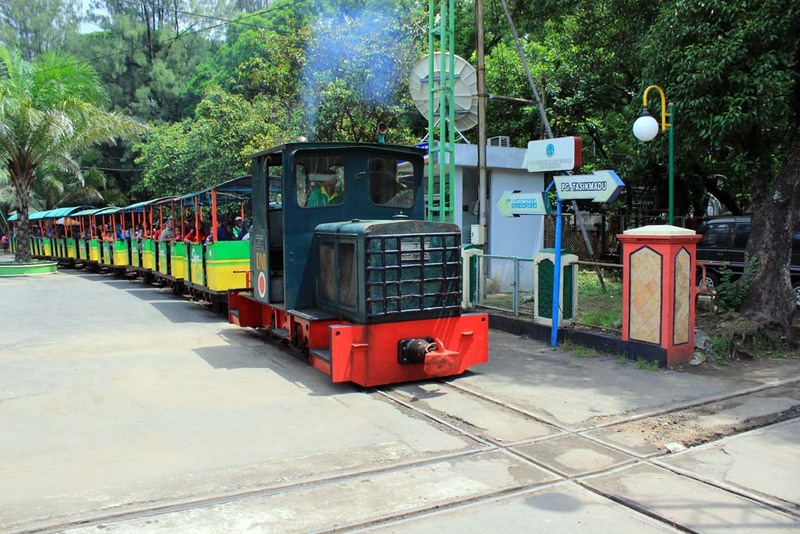 This loco is used to haul the train that plying the diesel route. 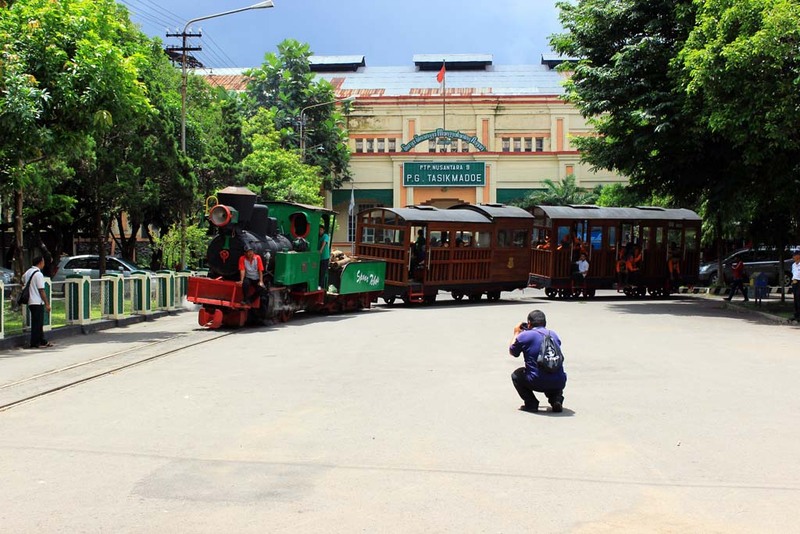 Of course, being railway enthusiast, no one can resist the temptation of taking its pictures. Apparently, just near the spot where we photographed the diesel train there is a huge mansion. 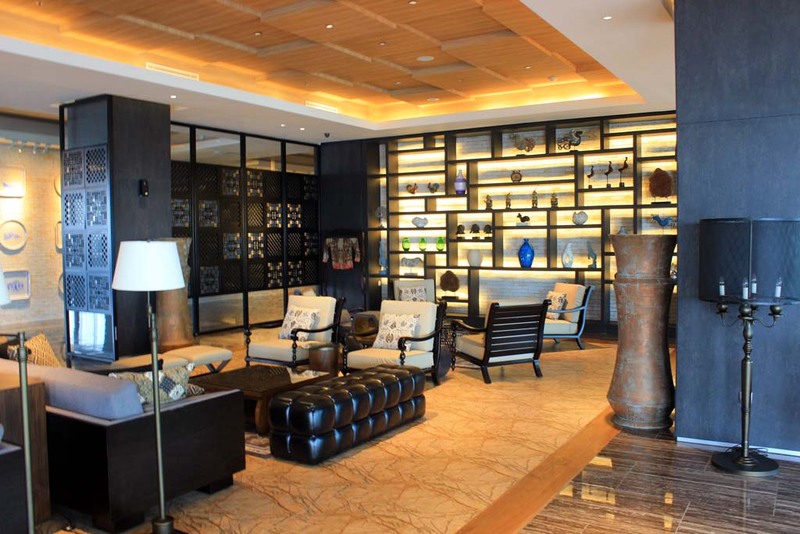 This mansion is normally reserved for the mill manager, or guest house for visiting Royals. But I have no clear idea on what do they use the building now for? For management office? 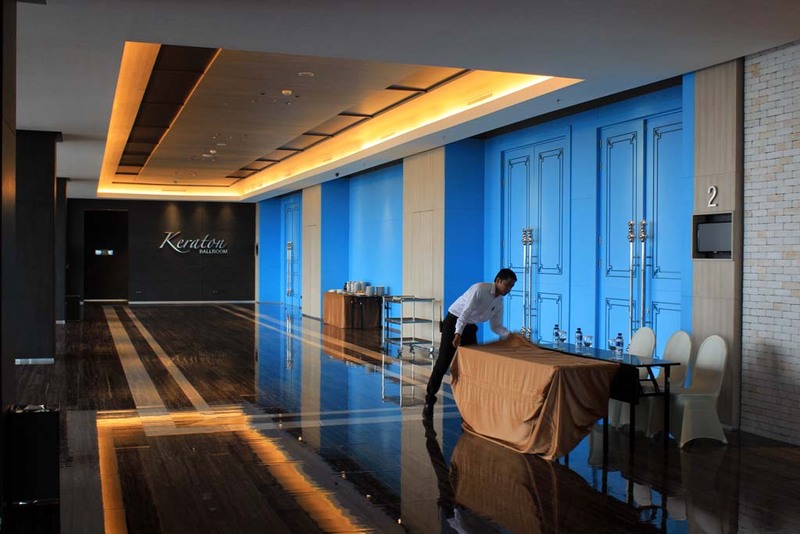 Or perhaps VIP reception place? The design of the mill building is undoubtedly something to behold. 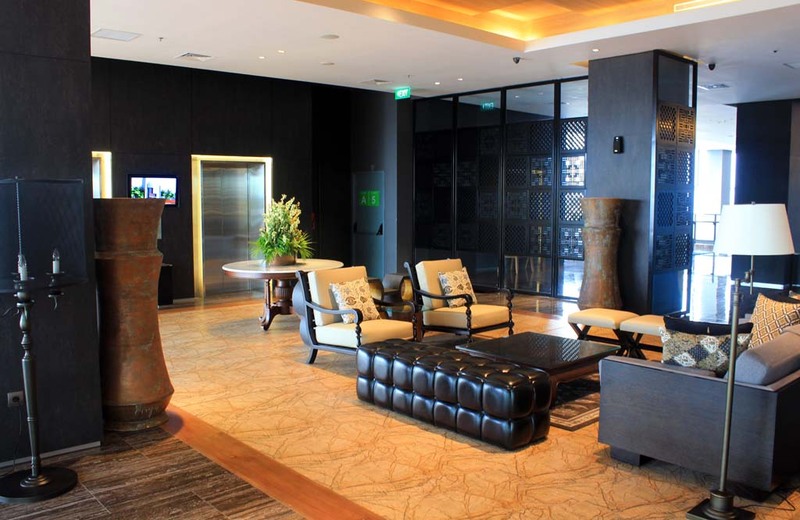 It is looks much more like an office than sugar mill. 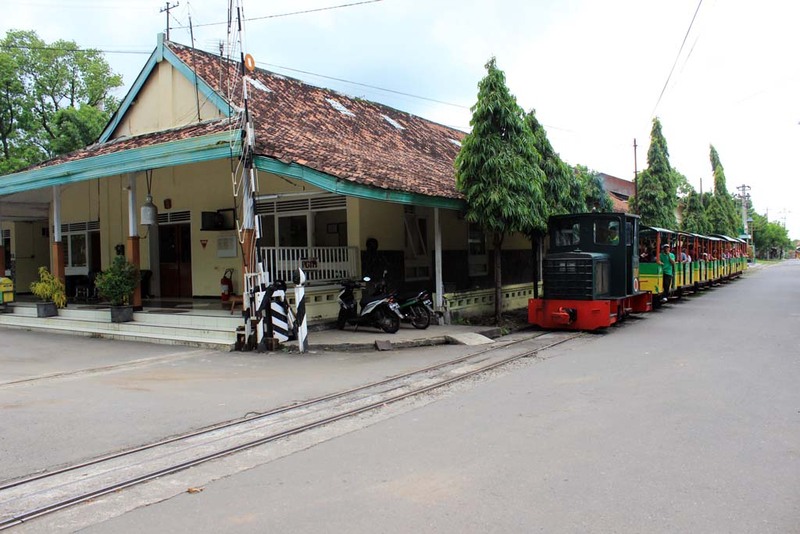 Some said that during the last decade of Dutch colonial era, Tasikmadu mill was the most modern sugar mill in Java, exceeding other mills whose are still operating their field lines and receiving awards such as Semboro or Olean. 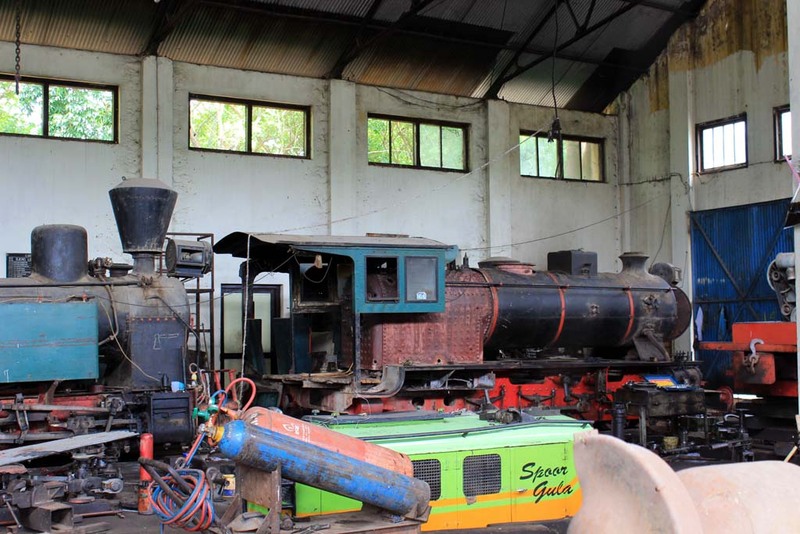 Not long afterward, the thing truly attracted us to visit this place did eventually appeared: Steam locomotive! 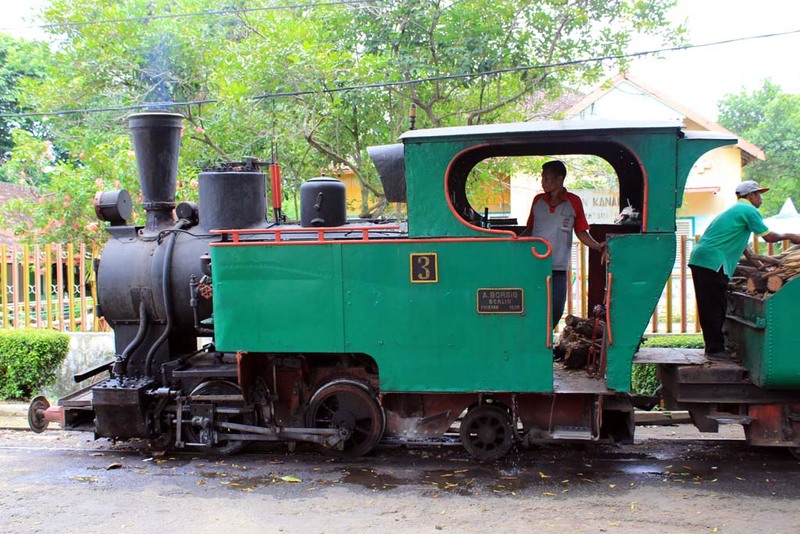 This Orenstein & Koppel built steam locomotive is one of 2 steam locomotives in operation for today. 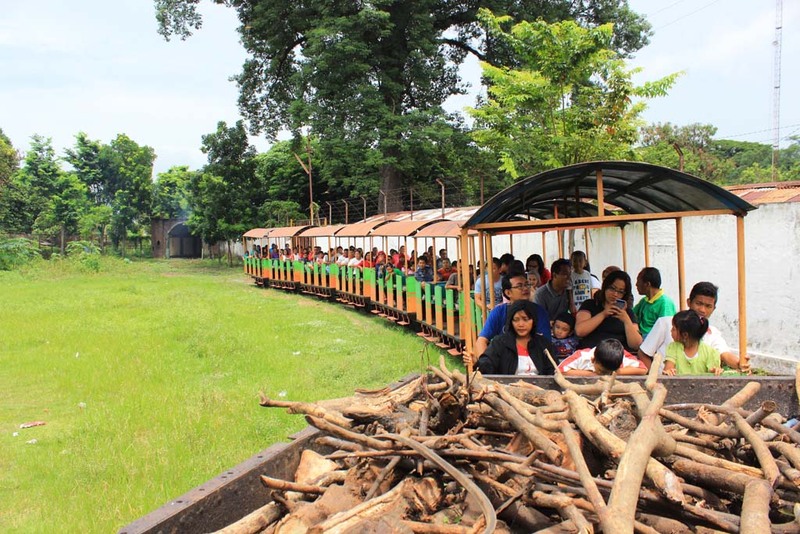 Unlike my previous visit in September 2015, this time some VIP coaches are employed for regular recreational train. 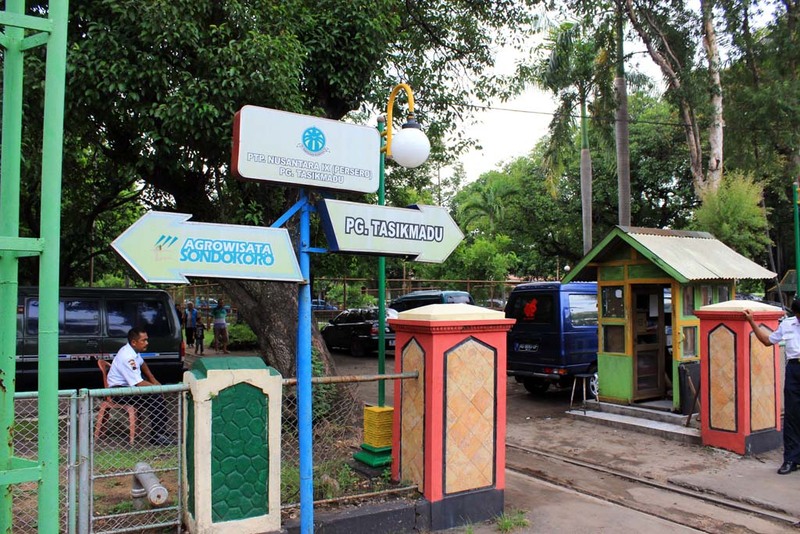 When we approached the theme park entrance, suddenly an elderly man with Agrowisata Sondokoro uniform approached us. He asked who we are. I answered that we are a group of railway enthusiasts on a railway tour. The old man introduced himself as Megan, and we called him pak Megan (“pak” is a title or salutation used to address a man much older than us). Pak Megan is the manager of Agrowisata Sondokoro. 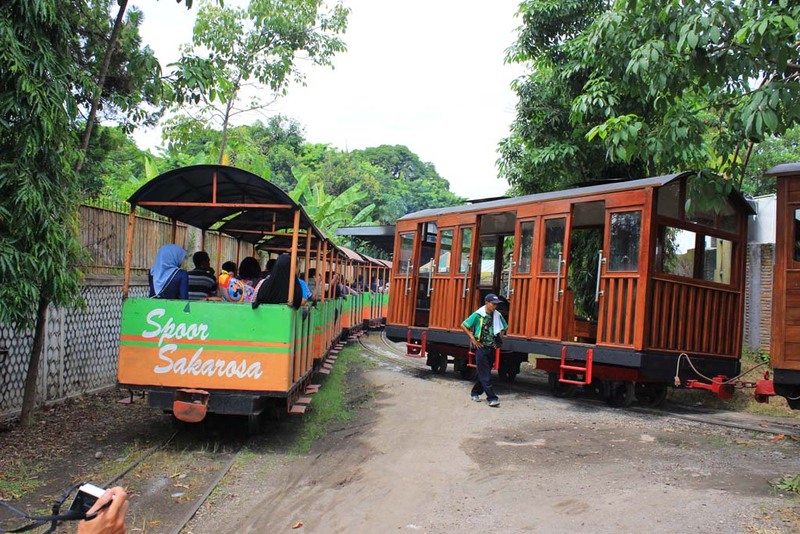 He is also the person who initiates the theme park program at Tasikmadu sugar mill. 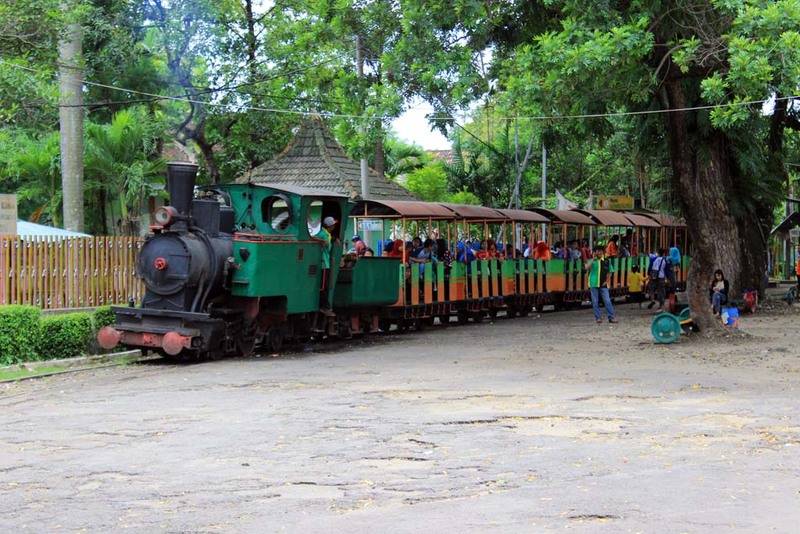 Although initially considered a side business , the theme park eventually developed into major source of income for the struggling mill. Being a brainchild of him, he was glad to show us around the theme park (and somehow we skipped the ticket booth, unintentionally). 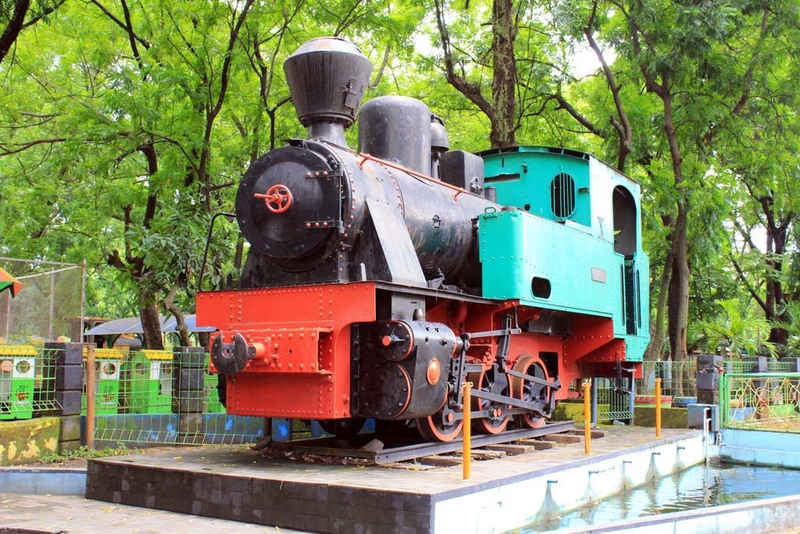 The first object is of course the steam loco that is displayed near the theme park’s ticket booth. 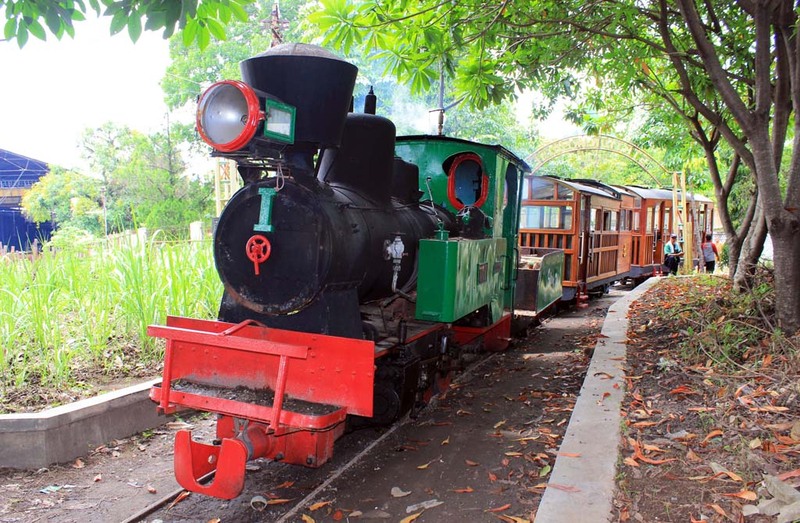 Although it is part of Tasikmadu’s fleet of steam locos, this loco actually run on the same gauge as State Railway (1,067 mm / 3ft 6in). 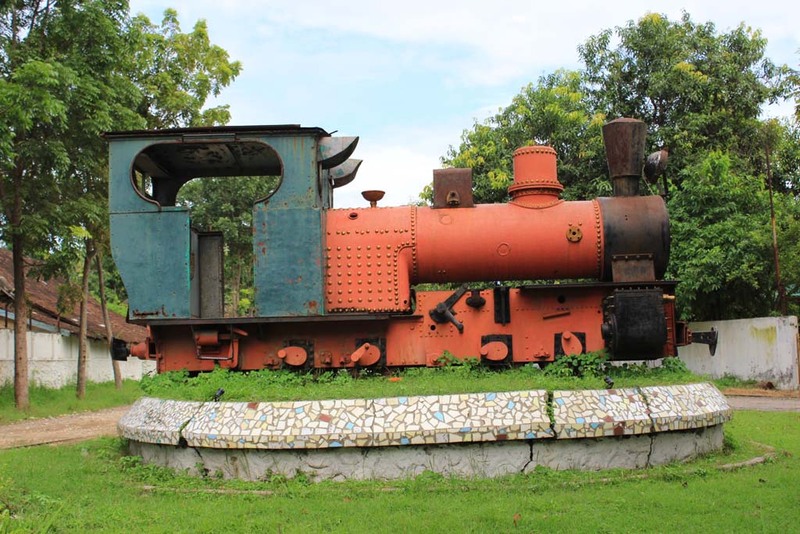 This loco was used to haul goods train that carried bags of refined sugar, and sugar molasses tanks, from the mill into Kemiri railway station. 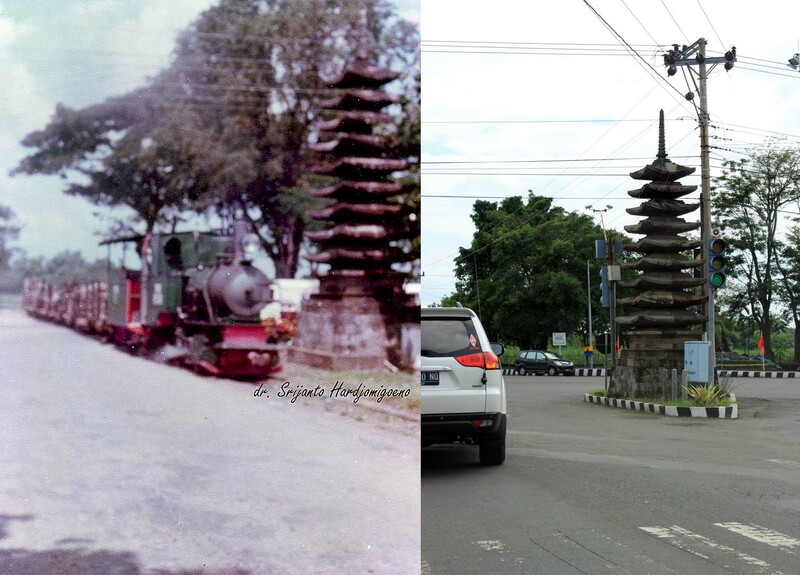 When the service was suspended in late 1980s, the loco was retired. 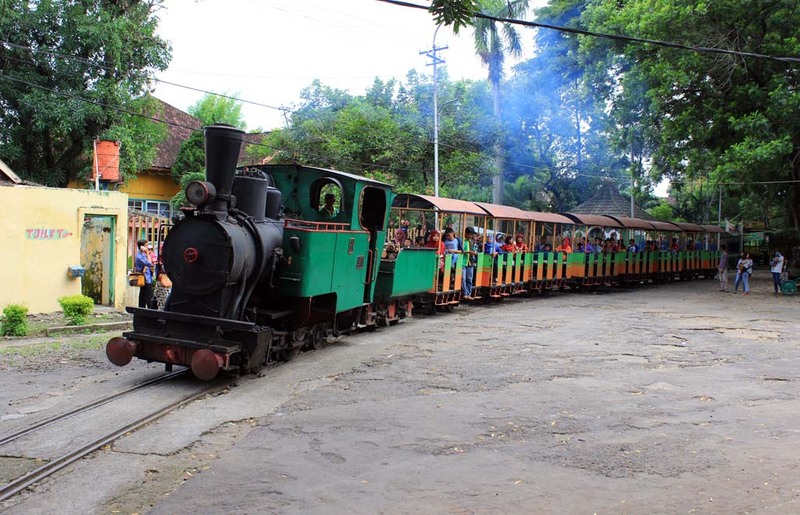 Pak Megan said that back in mid 2000s, during Jokowi mayoralty, there was a talk of using the loco for Sepur Kluthuk Jaladara steam tourist train. 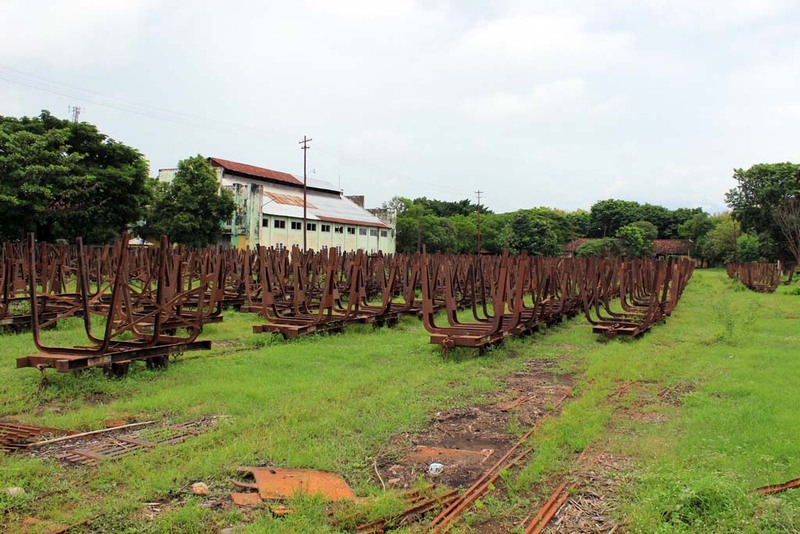 But the plan never materialized as the mill management couldn’t reach agreement with Solo city council. 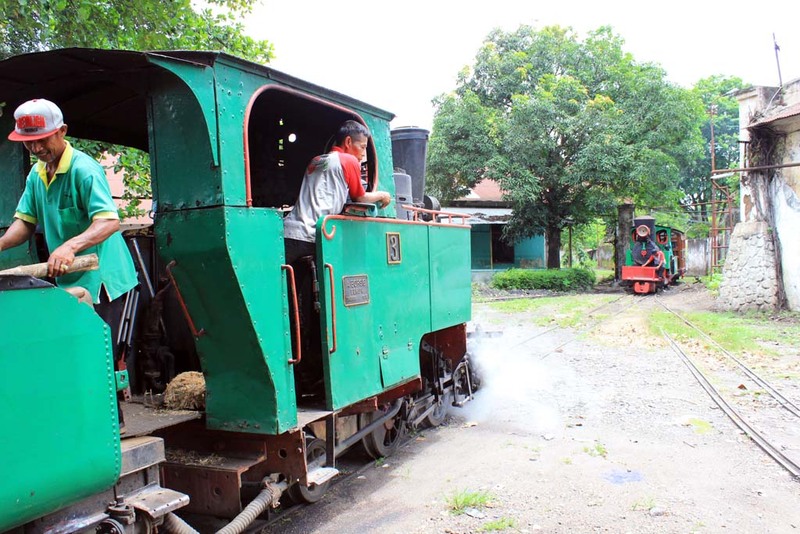 The city council wants to purchase the loco, while the mill management refused to sell it and would only accept the hiring scheme only. 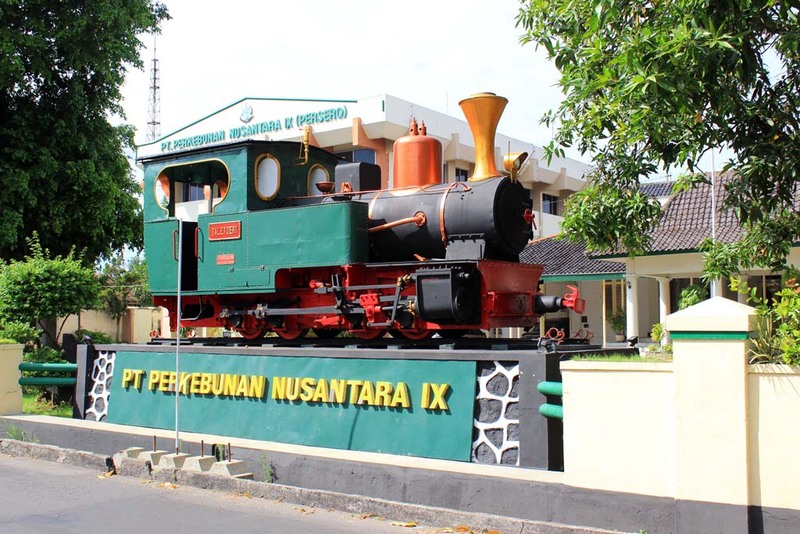 In the end, Solo city council settled with a C12 steam locomotive which ironically is actually hired (not purchased) from Indonesian State Railway. 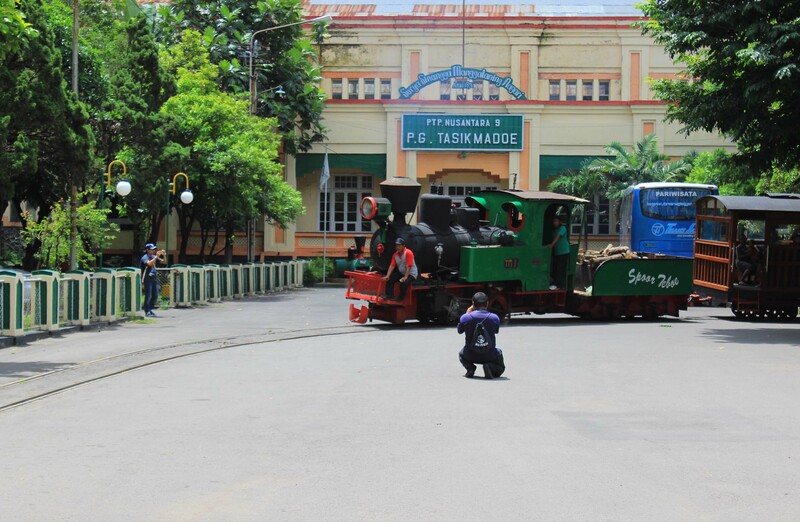 From there, pak Megan took us to see a steam roller which is parked near the employee housing area. 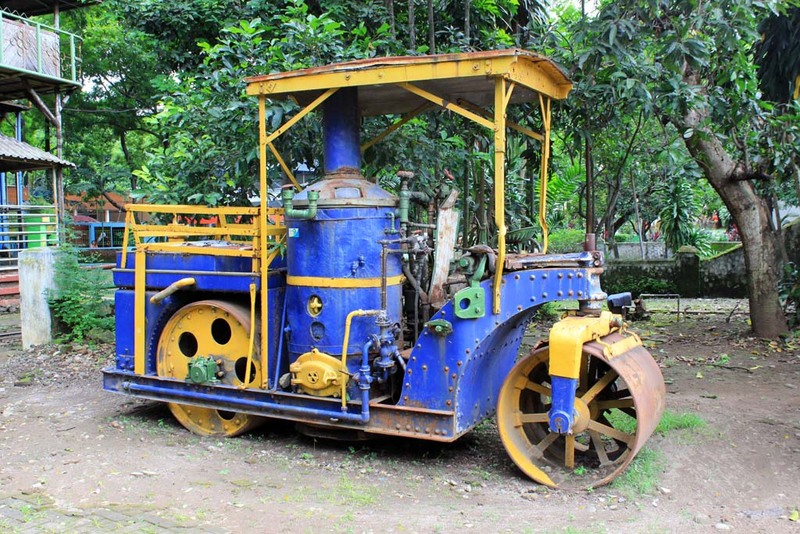 This Kelly Springfield-built steam roller is probably the only steam road roller still in operating condition in Indonesia, although it hasn’t been lit for some time. 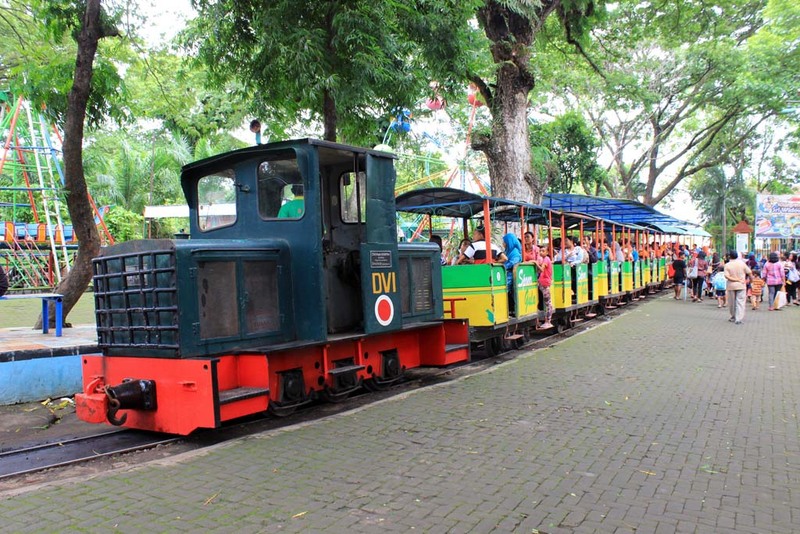 From steam roller we moved into the theme park, where we see this Diema locomotive. 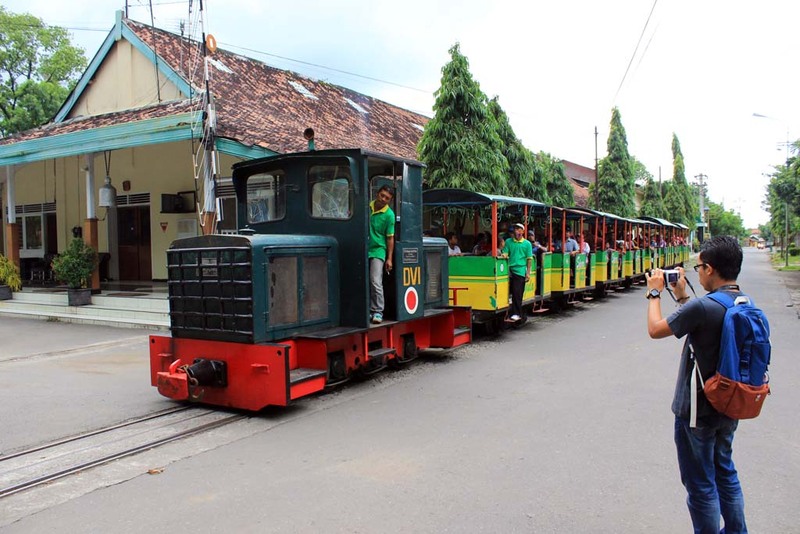 This mid-cab locomotive still wearing standard Tasikmadu livery, and this is probably the first time it runs after several years of absence. 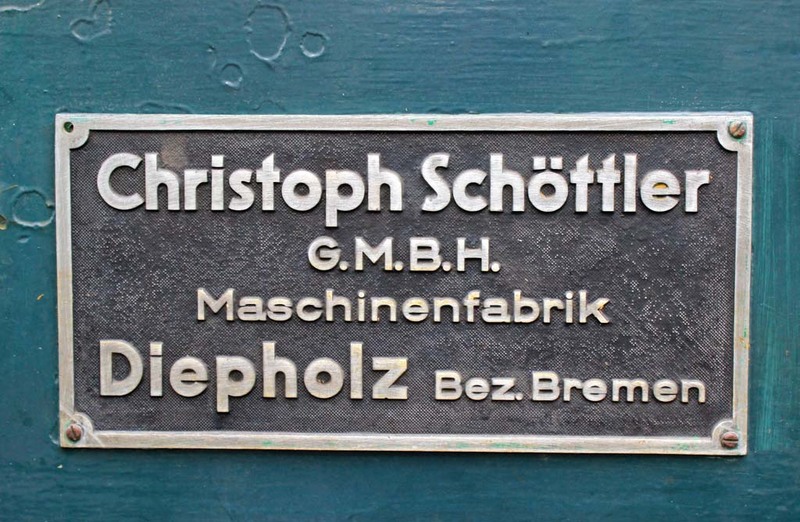 This locomotive was built by this German engineering firm, based in Bremen. We later could smell burning log aroma, and later a steam hauled train eventually arriving. 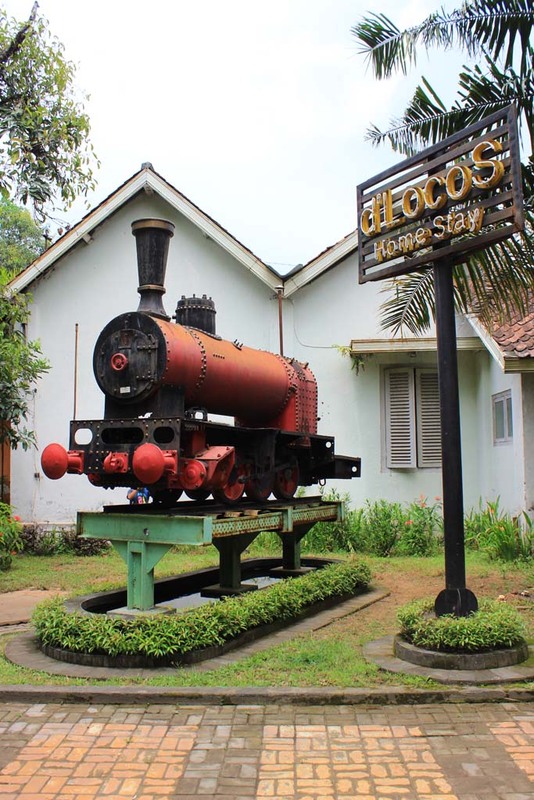 This Borsig-built Tasikmadu 3 is perhaps the only Borsig steam locomotive still in running condition in Indonesia. 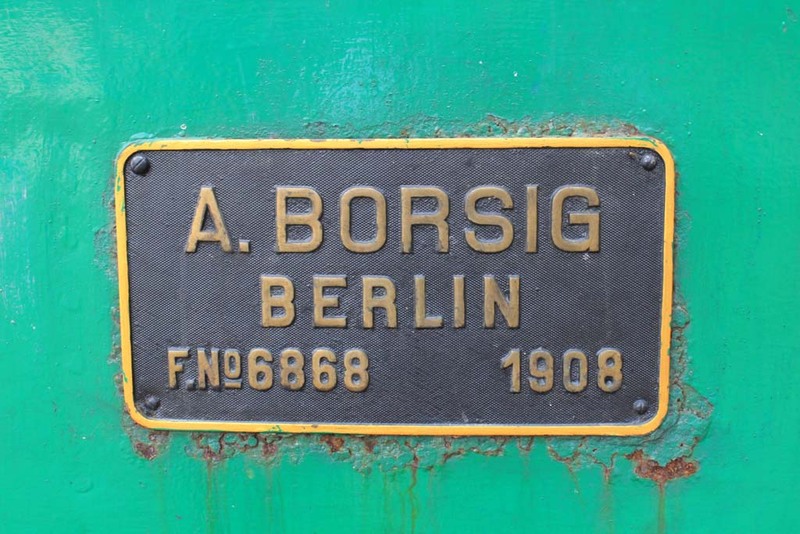 Not long after the Borsig loco passed, the Orenstein & Koppel steam loco is also coming. That was truly an impressive sight! 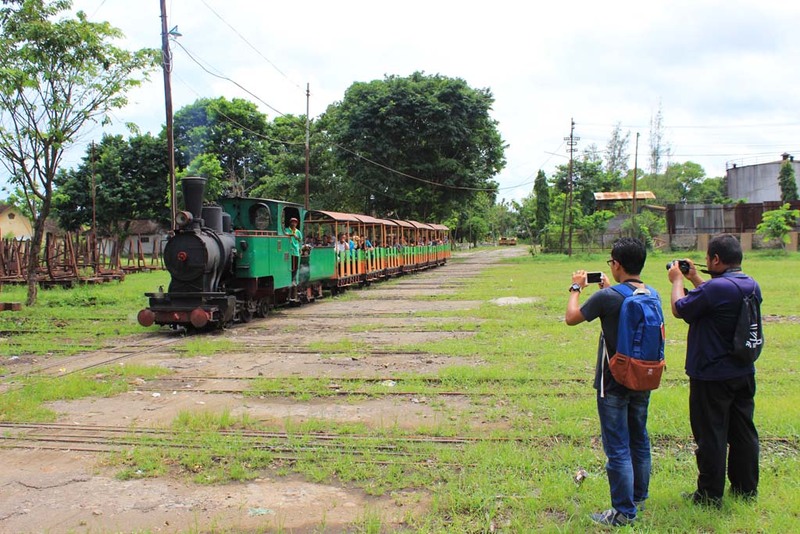 Pak Megan invited us to ride the steam train which we gladly accepted. 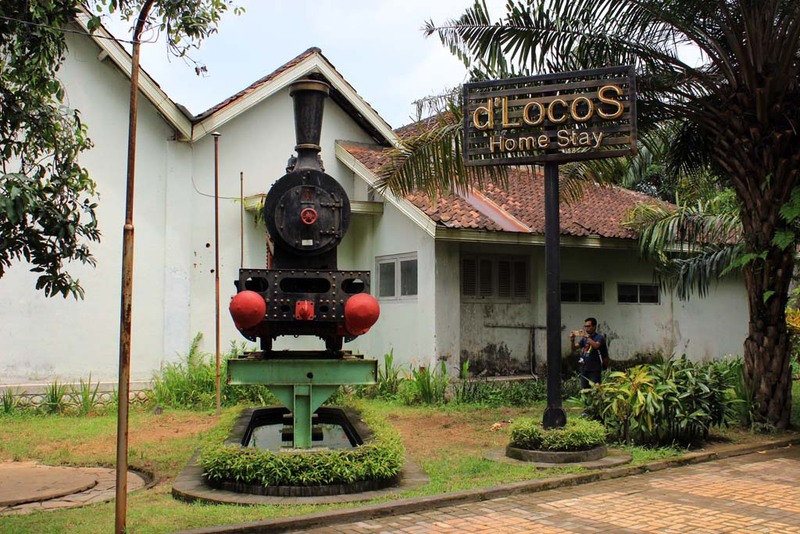 Upon arriving, we were slightly surprised to find that the loco is nowhere to be seen! Apparently it went to the refueling point to refill its water and logs supply. Once it completed its refueling process, it returned back to its train. 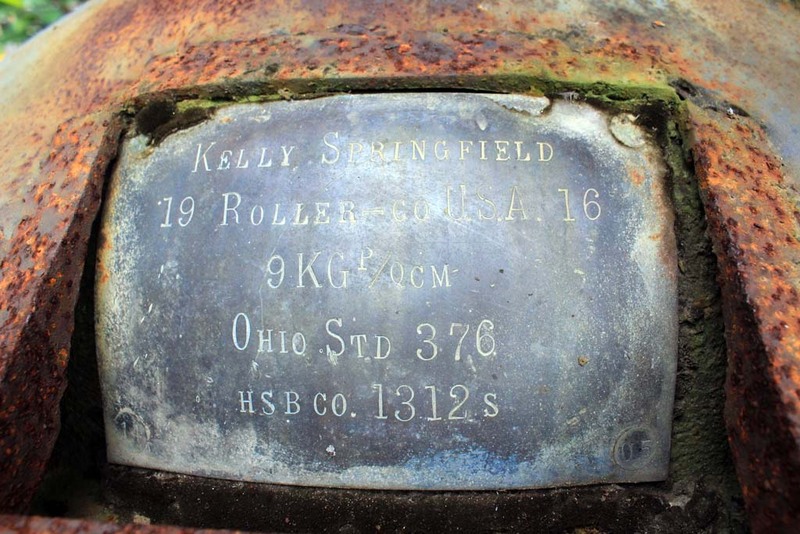 Upon looking at its builder plate, I was truly amazed by how old the locomotive is. 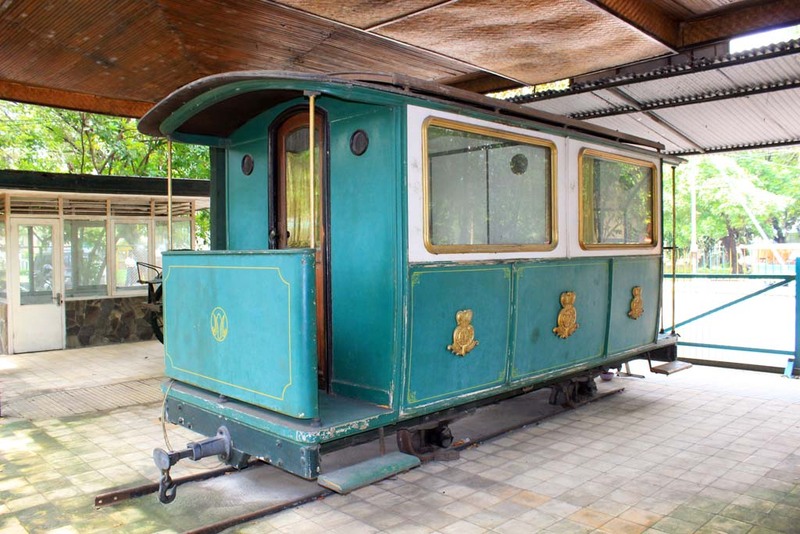 It was built in 1908, and still in running condition until now! It’s an example on how good the German engineering is. 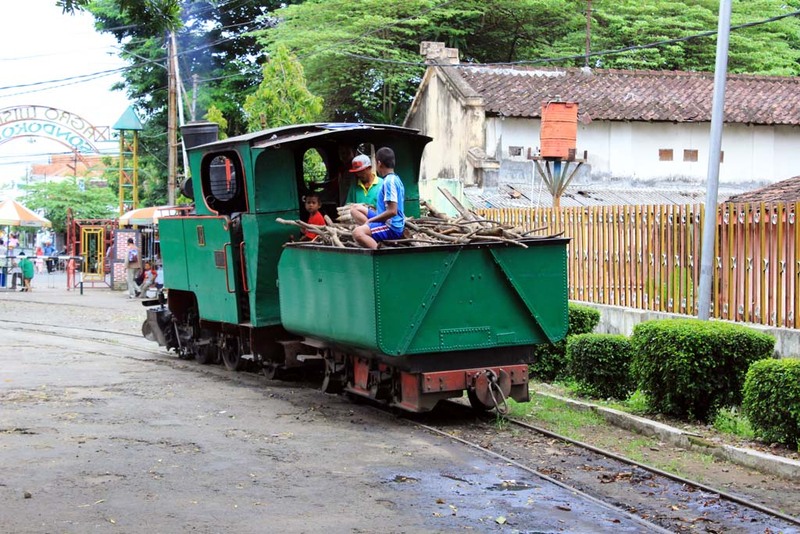 They’re built to last, as exemplified by this loco. 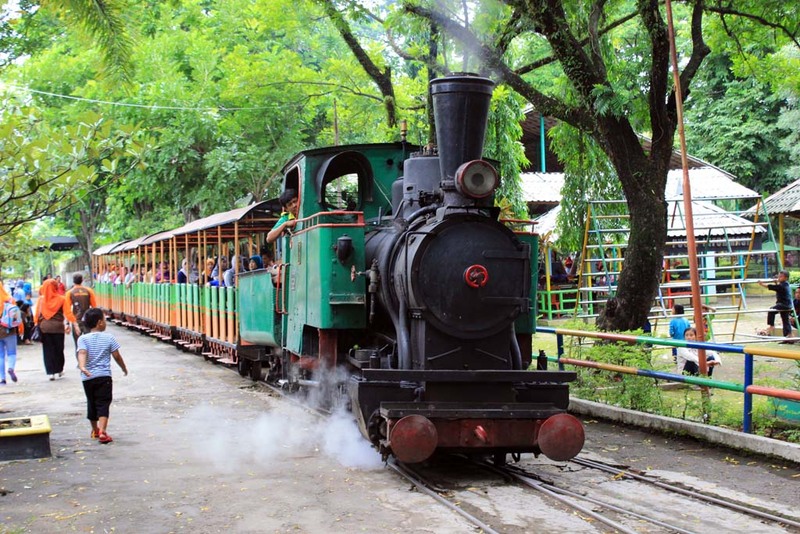 We asked on whether if we’re allowed to ride the locomotive. Pak Megan allowed us to have a cab ride (and it’s free!). 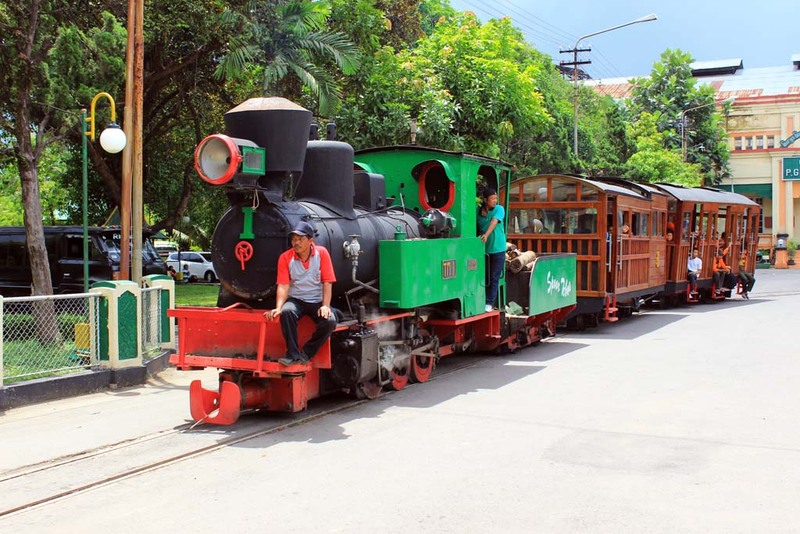 For Waktong and Hafizul this is once in a lifetime moment, as steam locomotives are rare in Malaysia, and riding them is generally forbidden in Malaysia. Not long, our train eventually departed. Hafizul using this moment to record the journey. 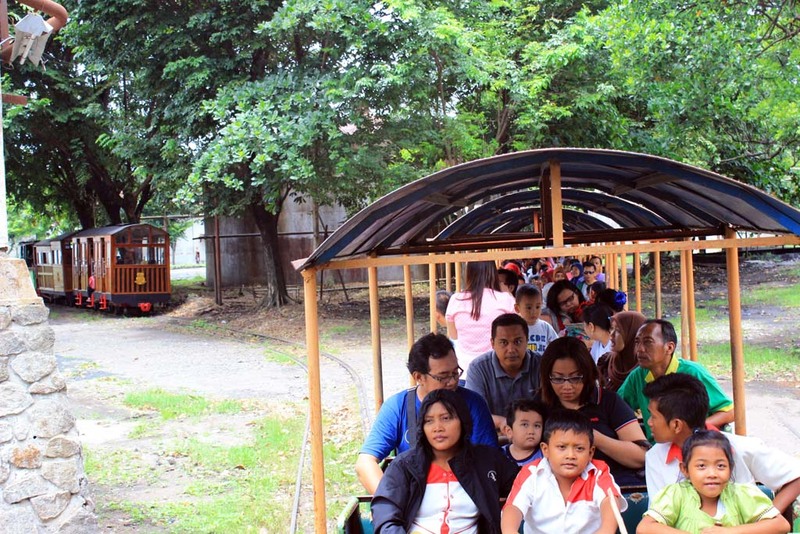 Our train traveling around the mill premises, ranging from employee housing and into an artificial tunnel which is specifically built for this tourist attraction. 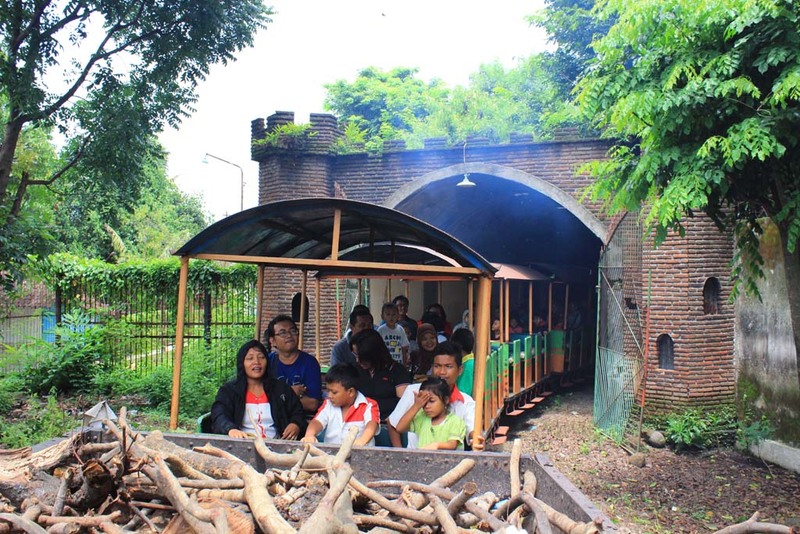 Once we exited the tunnel, everyone are gasping to breath fresh air…. We are now outside the the mill compound, traveling in front of the entrance door. 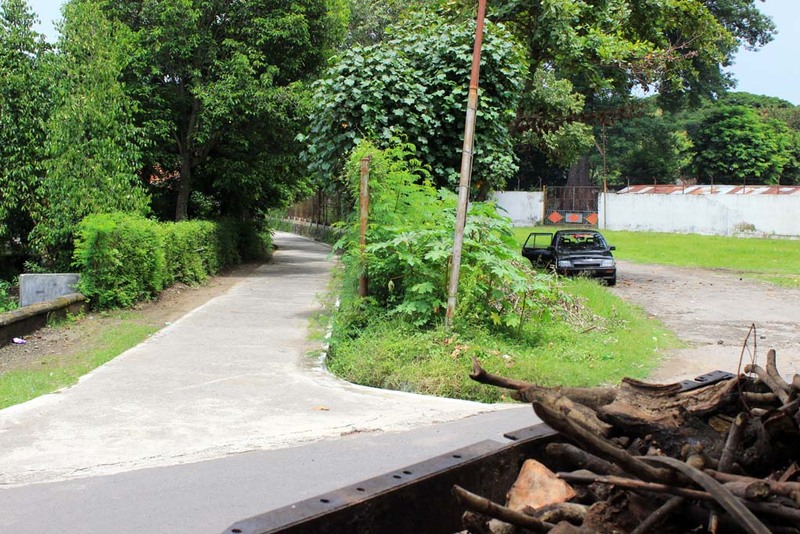 This pathway was once part of Tasikmadu’s field lines. 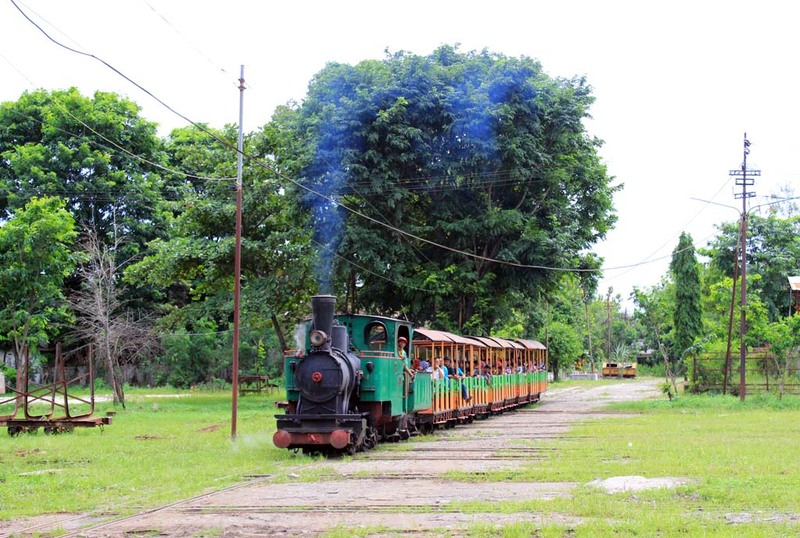 In fact the railway line that connects the sugar mill and Kemiri station used to be here too. Could it be a dual gauge line? As we entered the mill, we had to stop to allow the O&K to passed us. 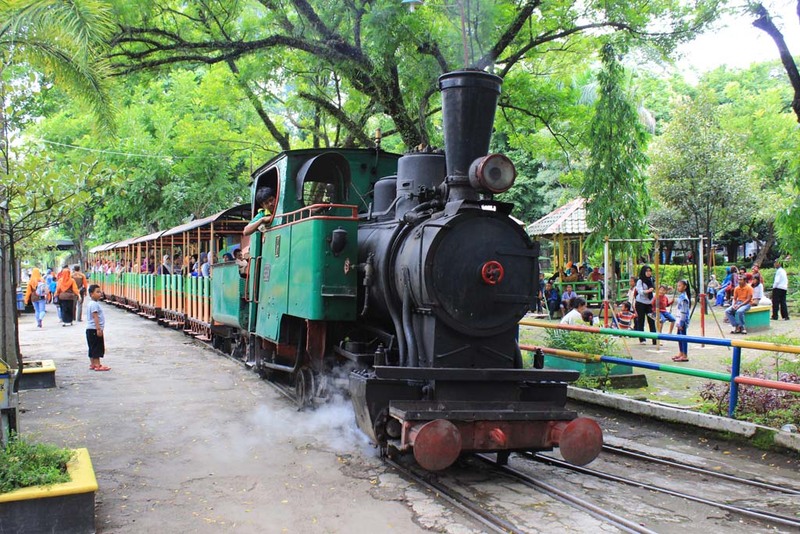 Once the train cleared our track, we resumed our journey. 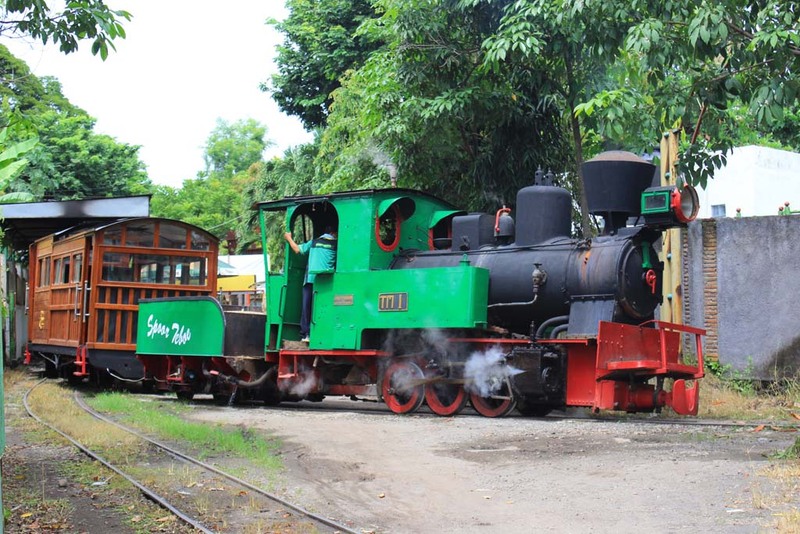 Our train also passes through the grassy looking main yard. This moribund looking yard looks as if it has been abandoned. In reality, it is not. It’s a common sight during off-harvesting season that the mill looks like abandoned property. 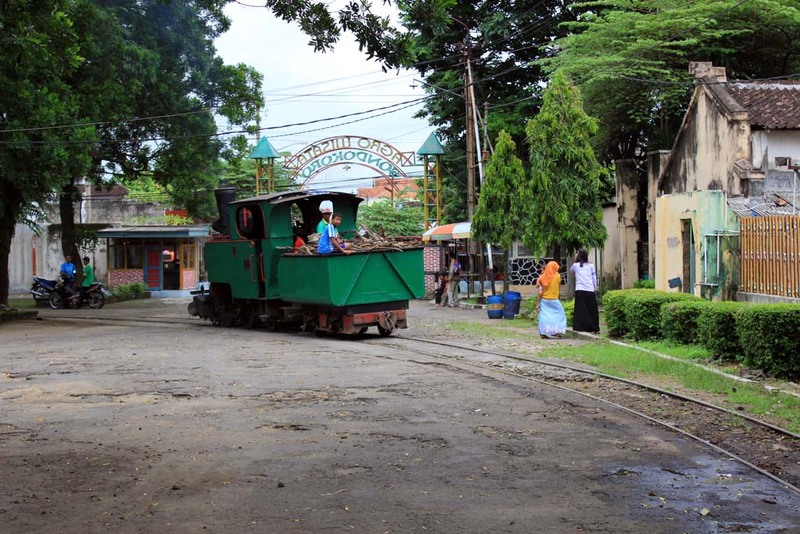 We returned back to the place where we started, and we disembark from the train and bade farewell to the driver. Pak Megan showed us around, including to this hostel, built in the mill premises. 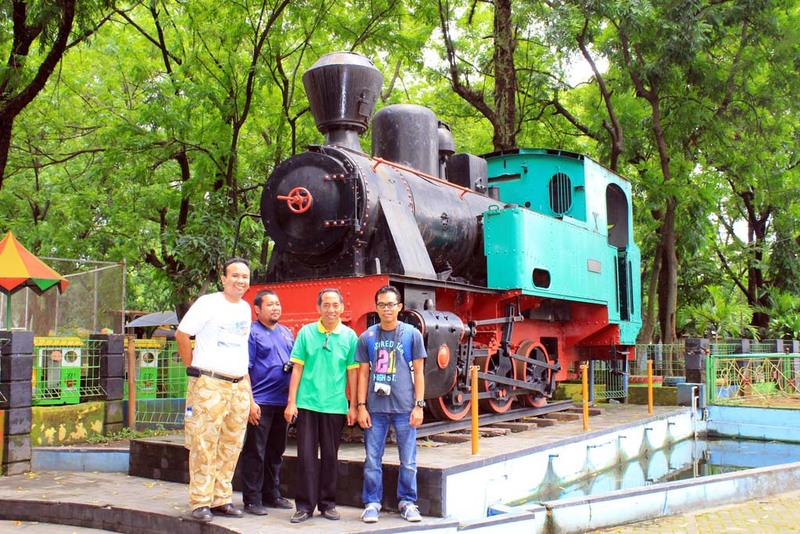 Right in front of it, there is one incomplete steam locomotive displayed. I’m not sure about its identity. 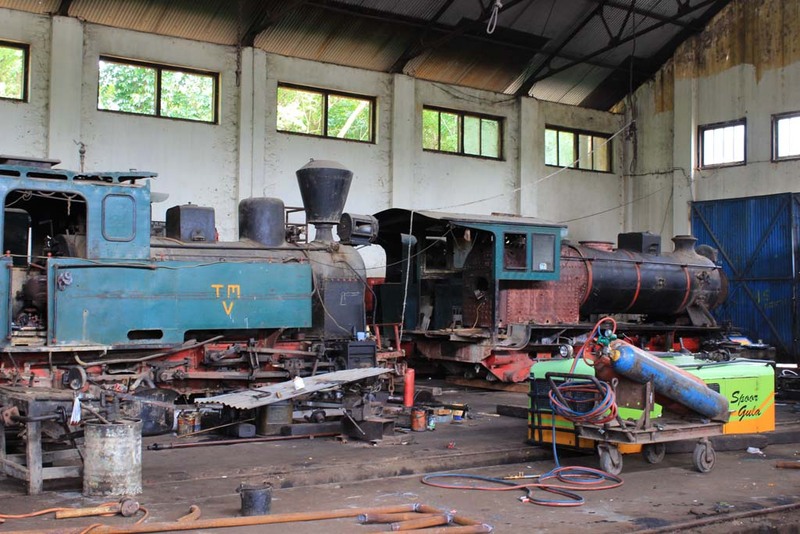 But judging by its buffer, I believe it is former Tasikmadu’s loco. 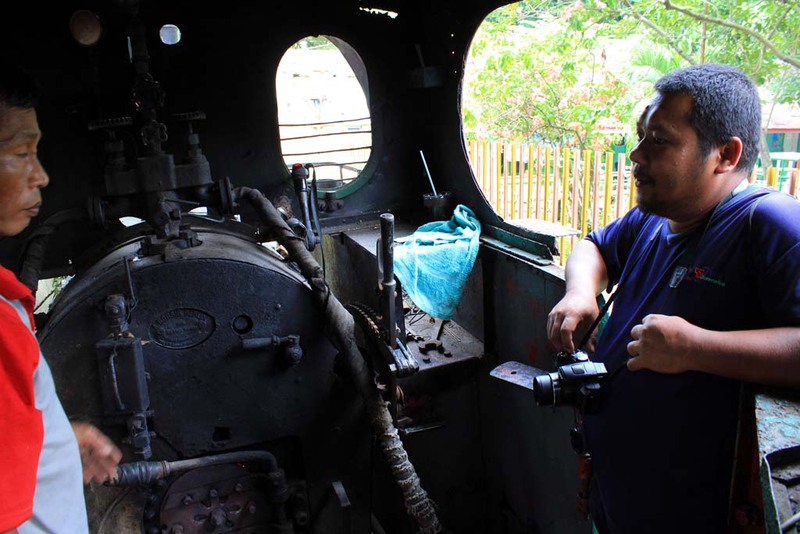 We wants to see the locomotive shed, and pak Megan is also keen to show some of the progress that has been made on the tourist train. Unfortunately, upon arriving we’re a bit surprised to find that it is locked. Apparently the shed supervisor in charge of carrying the key is having off day. 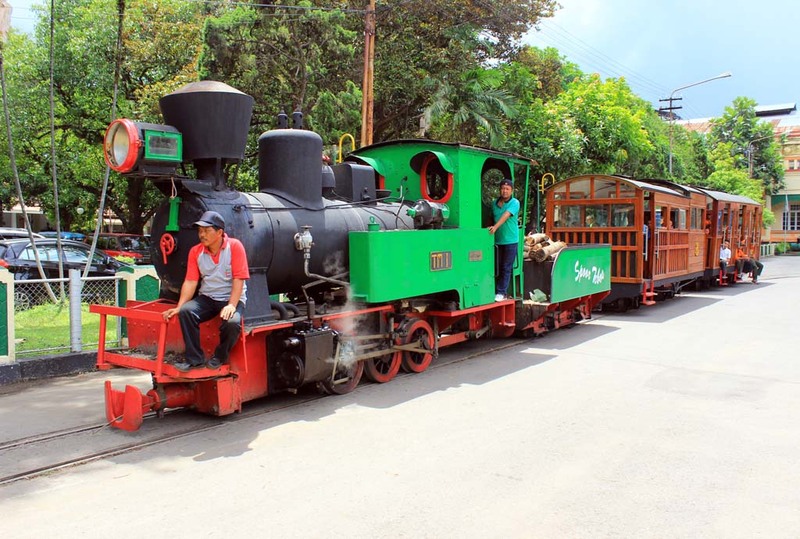 So we can only see the locos by peeking through the window. 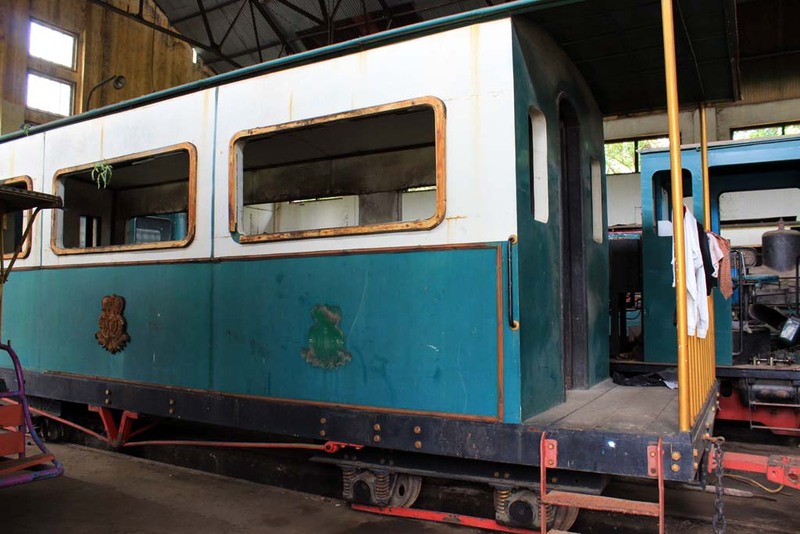 Right on the edge of the shed, I couldn’t believe what I see: the Tasikmadu VI having its cab panel removed. It probably underwent maintenance in preparation for the following season. But considering last year’s harvesting season, where the loco was only used on chartered basis, what will they do with the loco for this year anyway? 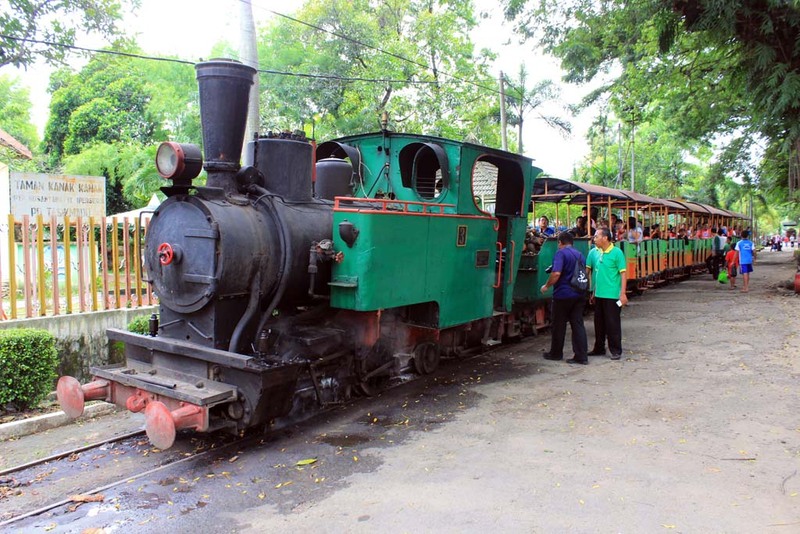 Pak Megan told me that the loco will be used for recreational circular railway. 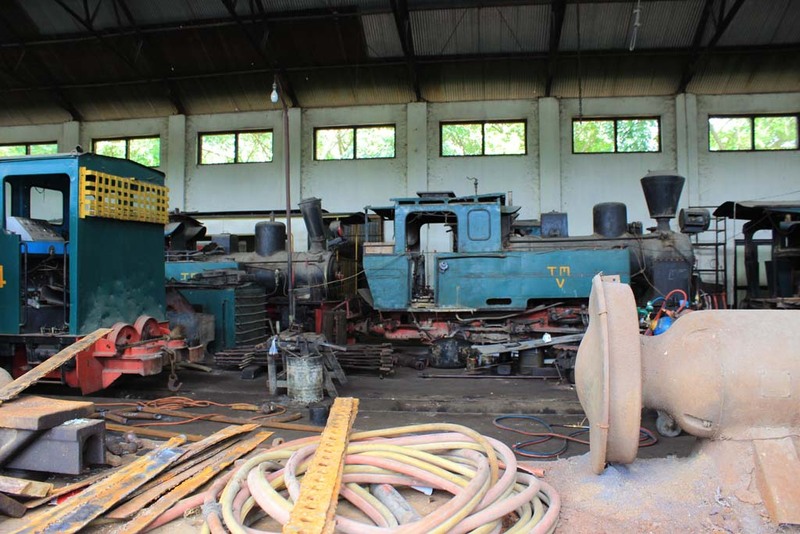 It will be used on the line currently plied by Orenstein & Koppel no 1 loco. 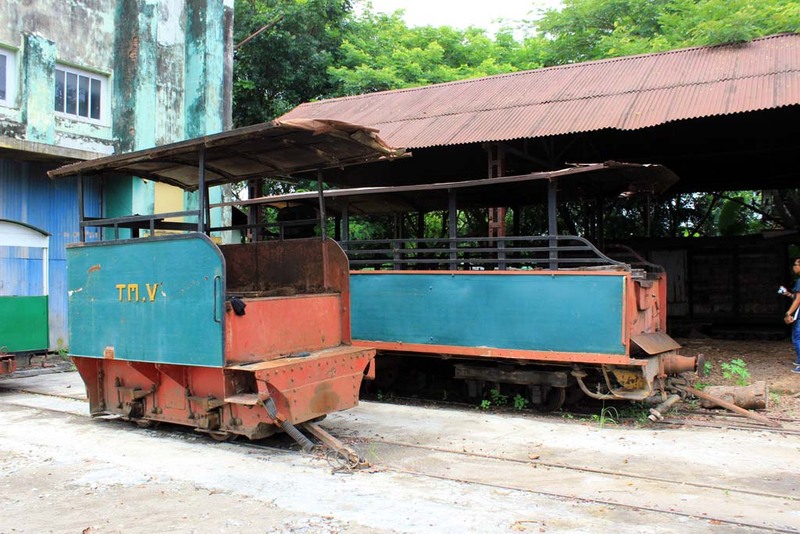 Right behind it is Tasikmadu V. Aside of number VI, it was regularly used for shunting in the yard. 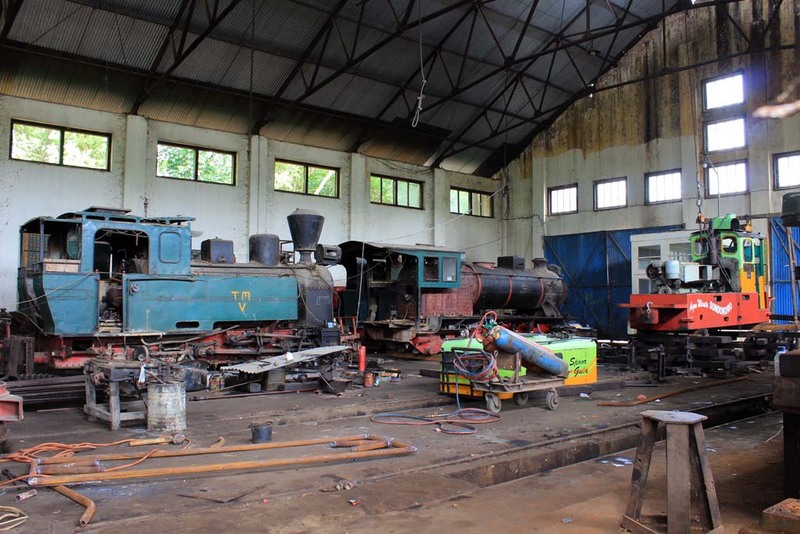 I have to admit that the loco shed looks a bit messy now. 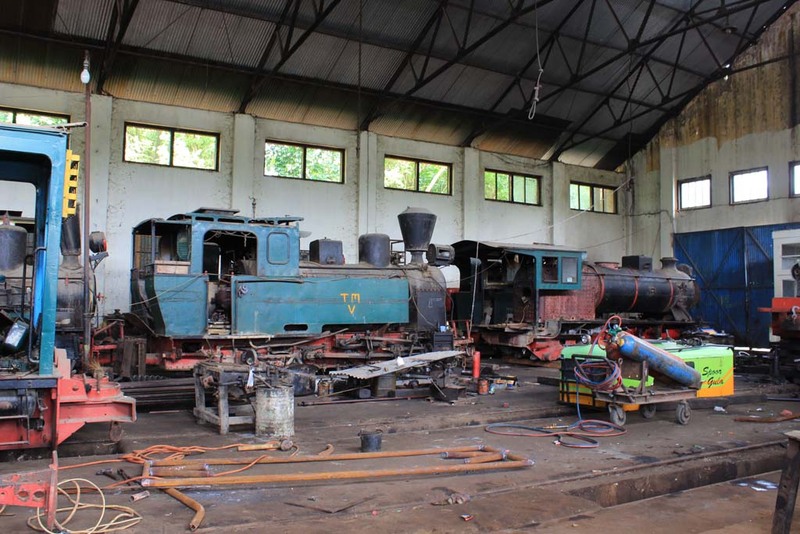 There are more locos in the shed, including some large Japanese diesel locos. I believe the type was probably introduced in 1980s, during Tasikmadu’s last decade of field lines operation. And right next to it is another VIP coach which styled in similar fashion as Royal inspection coach. 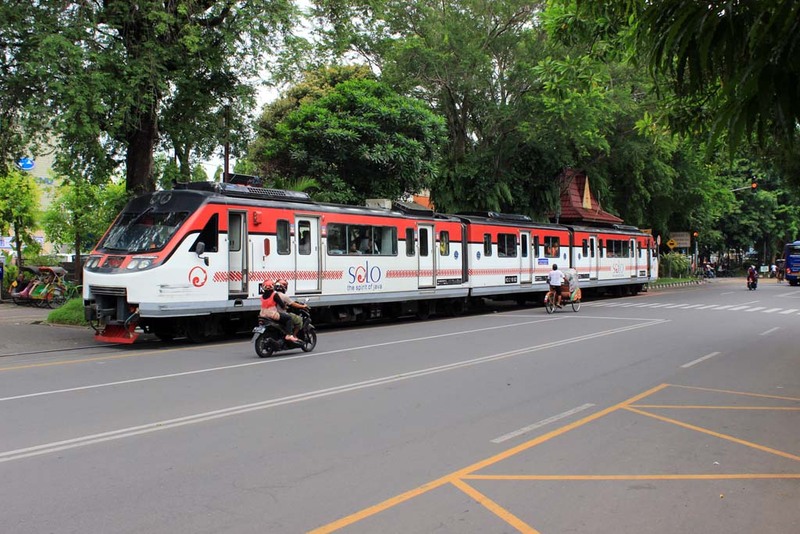 Pak Megan said that it will be used on the train currently hauled by the Borsig loco, replacing the current open air coaches. Slightly out of the picture to the left is a mechanized inspection vehicle. Last year I saw it dumped behind the second shed, but now it has been refurbished. 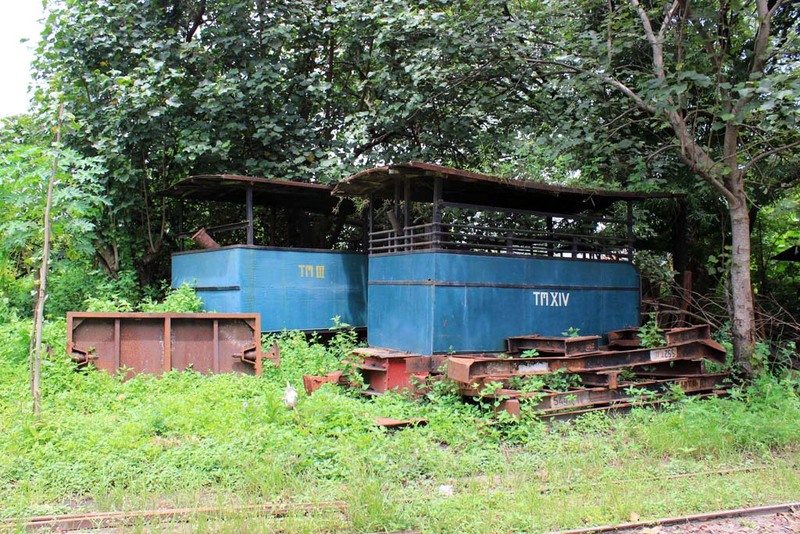 I also found the Orenstein & Koppel diesel loco which would normally be used for circular train. But it is being mounted on pedestal for maintenance. 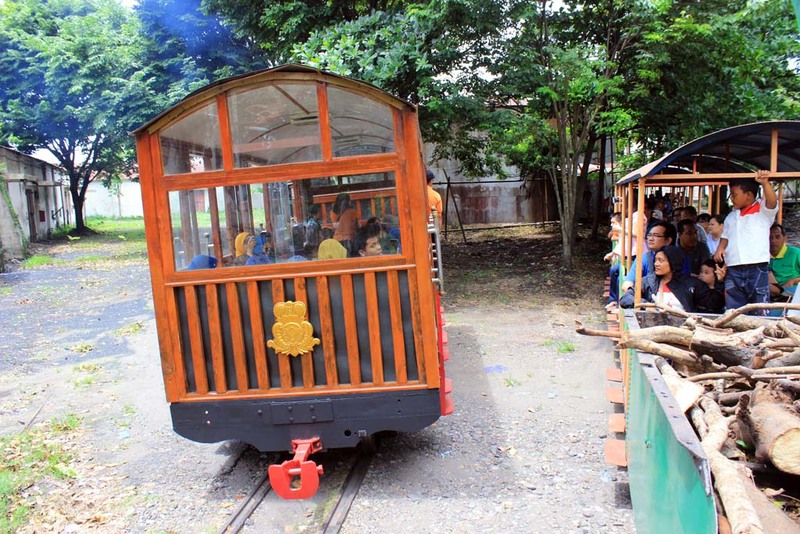 Right in front of the shed, there are 2 tenders whose are belonged to the number V and VI. 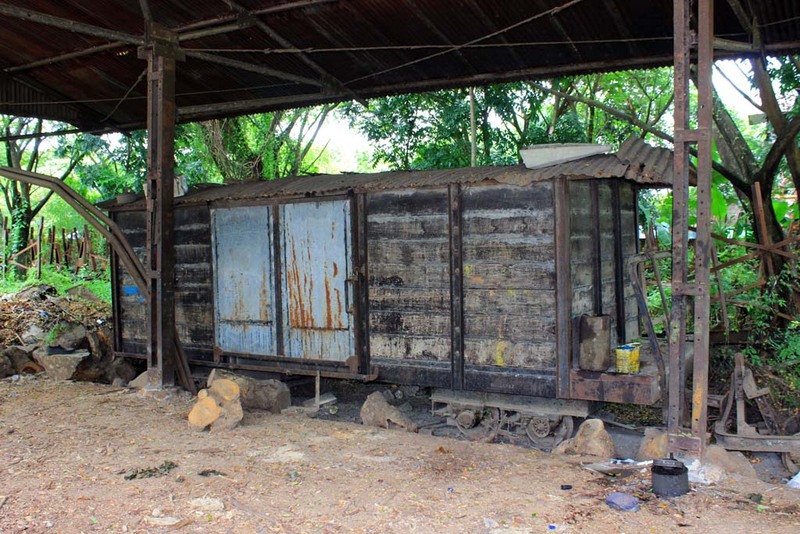 Under the shed beside the tenders, I also found an old freight wagon in derelict condition. Judging by its size, I believe it ran on 750mm lines. 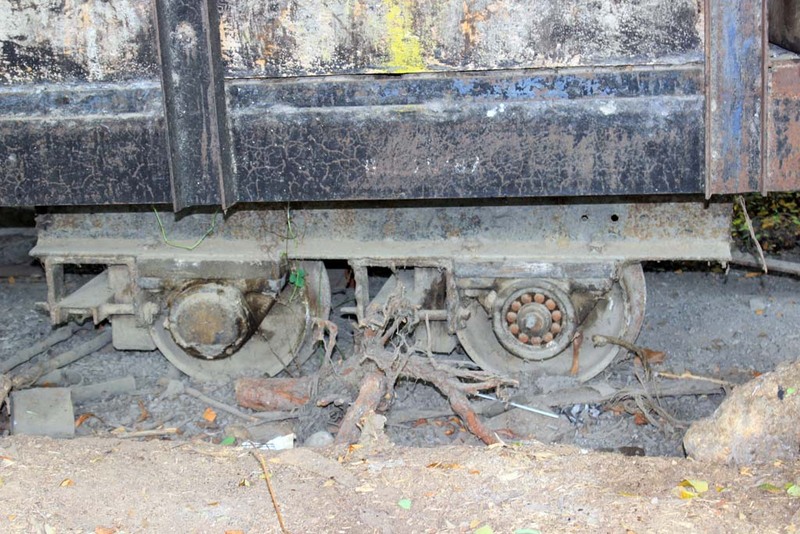 But what surprised me about this wagon is the fact that it has roller bearing axles! It is a novelty for such operation. 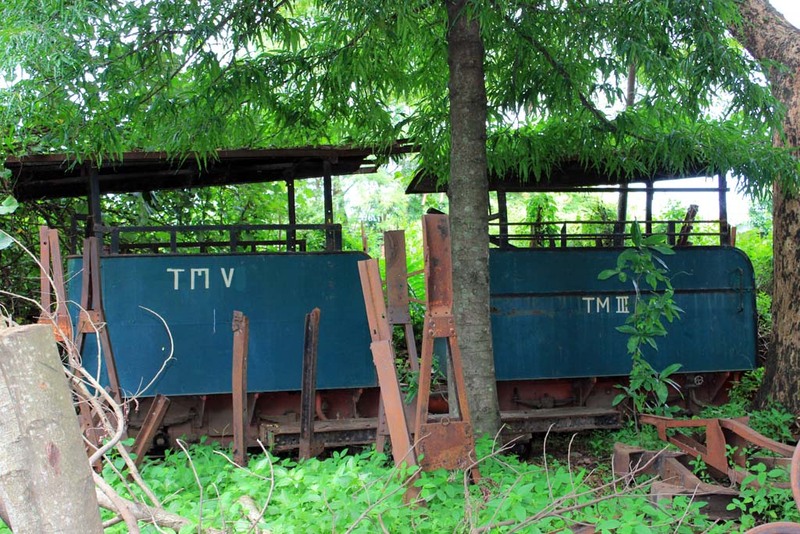 Behind the shed, we could also see some engine tenders being dumped. The lack of field working probably made them redundant. 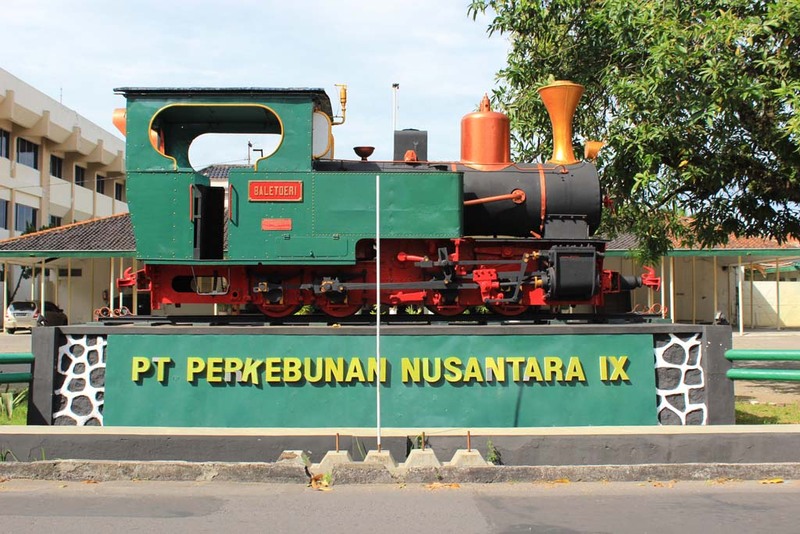 As we moved along, I was a bit surprised to find that there is another tender number V.
I was told that some of the locos in Tasikmadu have identical number. 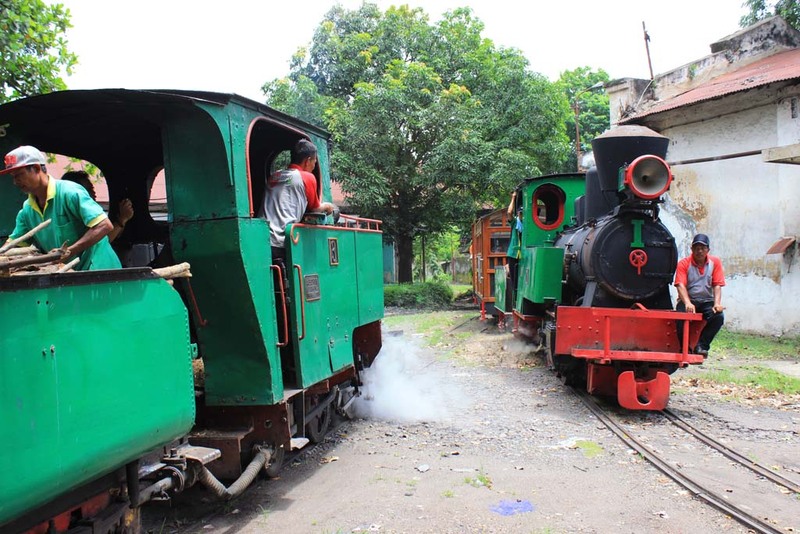 Some may just be the Roman number version of other, The reason behind number mixed up is due to the fact that some locos in here were originally belonged to other mills, but transferred here for preservation after their former mills were closed. We also see a plowing machine preserved here. 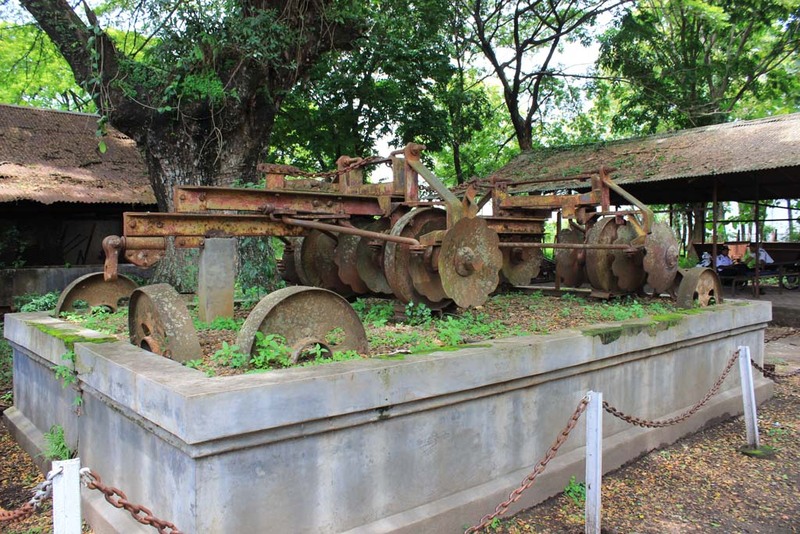 This machine was used to plow the sugarcane field. But due to change of land ownership in 1980s, the farmer would plough the land using their equipment, rendering this machine redundant and eventually retired. Right next to it is the weighbridge. 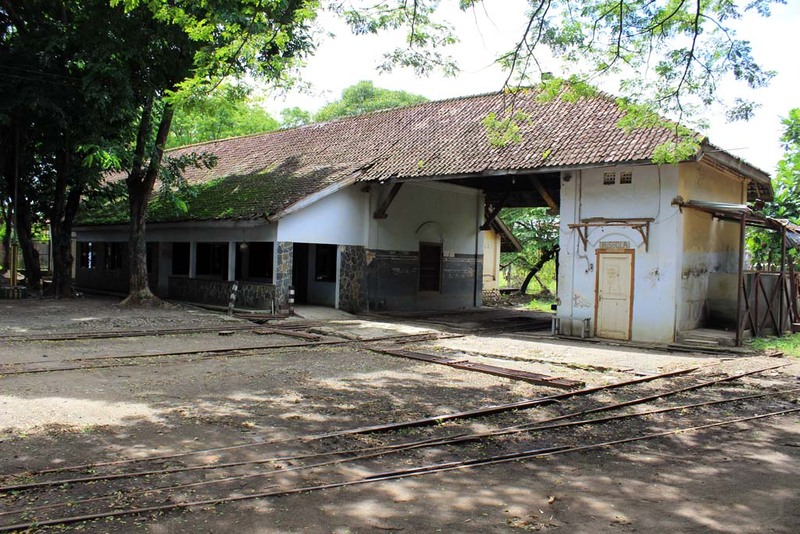 This building is where all of the loaded sugarcane wagons arriving from the field weighed before being unloaded at receiving station. It is also acted as a gateway to the mill’s yard. Beyond this place, the field lines started. Up until 1993, the railway lines beyond the weighbridge used to go very far. 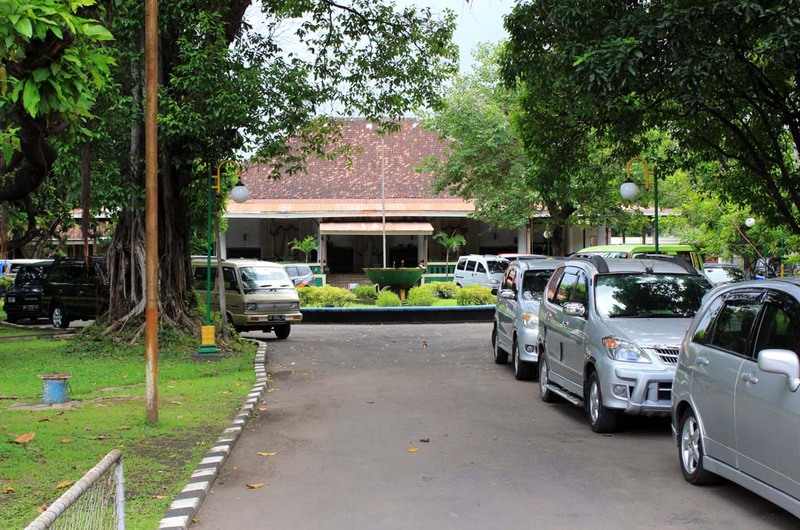 Even all the way to Matesih, which is right at the foot of mount Lawu, 20 km away from the mill. But from 1994 harvesting season onward, the field lines activity were intermittent if non-existent after all. The last recorded field lines action was back in 2000, where a single short train ran to easterly direction. Now only around 100 meters of railway track beyond the weighbridge left. The rest have been removed. 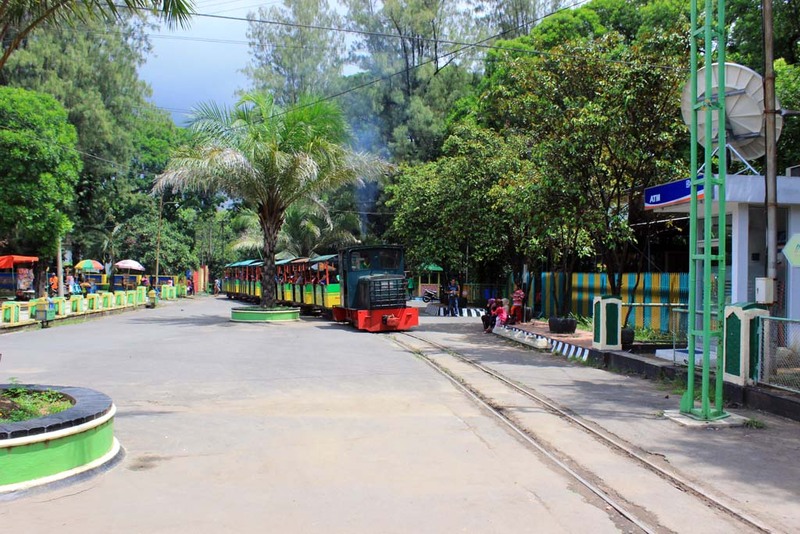 Pak Megan told me that there is a plan to revive portion of field lines for tourist train where passengers could visit tourist villages around Karanganyar by train. Despite support from local government, the funding has yet to materialize. We returned back to theme park to prepare our journey back to Solo. As we walk along, we suddenly caught a sight of the Borsig traveling through an open space in the yard. 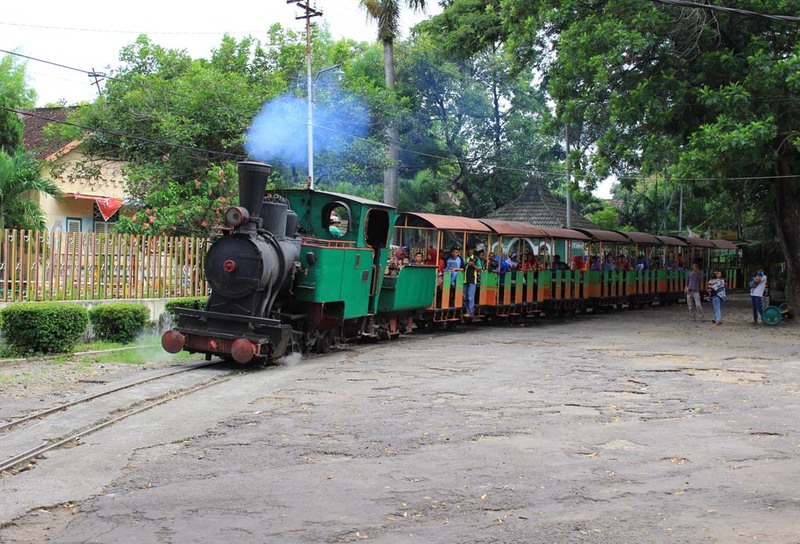 As it about to enter the theme park, it crosses with the Orenstein & Koppel train. The O&K loco stopped for an unusually long time. 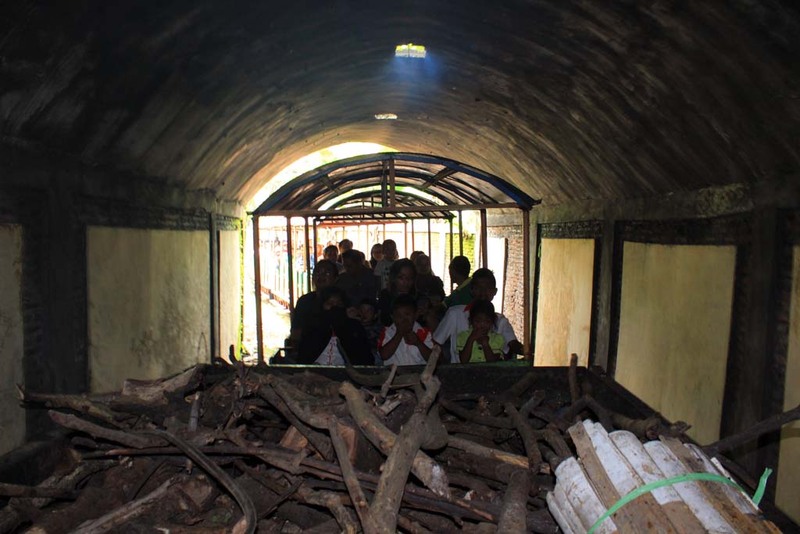 When pak Megan double checked with the crew, it turned out that it is running out of logs! 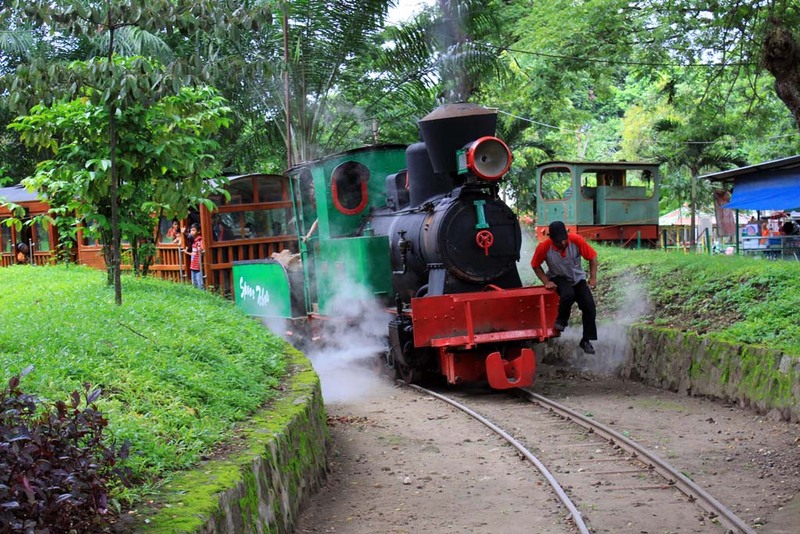 There is a pile of logs at the other end of the park, but it is only enough for one loco. So they had to buy from somewhere else. Pak Megan was infuriated by this, and reprimanded them not to repeat the same mistake. As soon as we returned back to the mill, we bade farewell to pak Megan and hoping that we could return back again in the future. But before we left the theme park, we photograph the Borsig as it departs for a single lap around the mill. We return back to our car and our driver took us out back into the city. 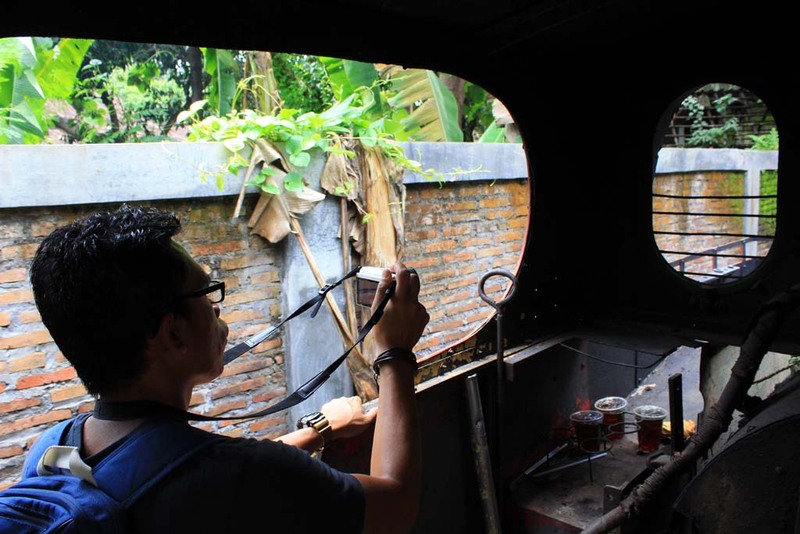 But as we crossed this steam locomotive, Waktong asked the driver to stop, so he can take picture of this loco. 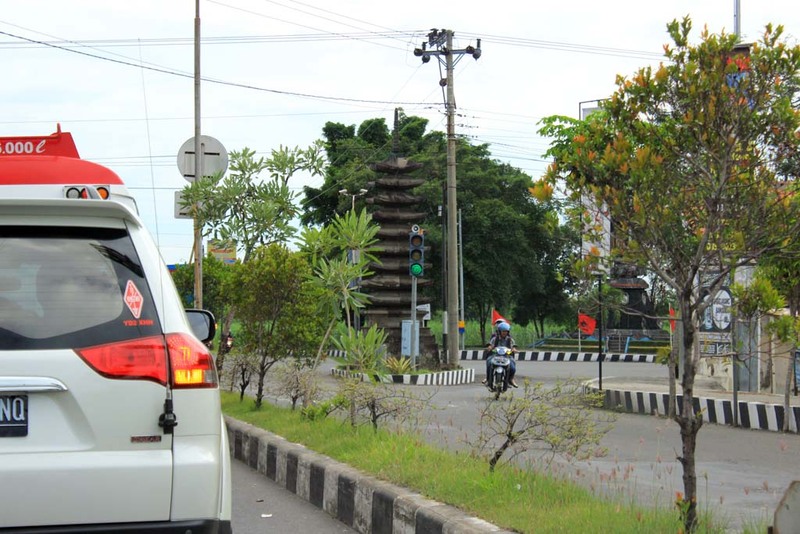 The traffic to Solo is busy, and along the way I caught up with this monument which is located at the junction with the main Solo-Tawangmangu road. I suddenly remember my friend’s photo. 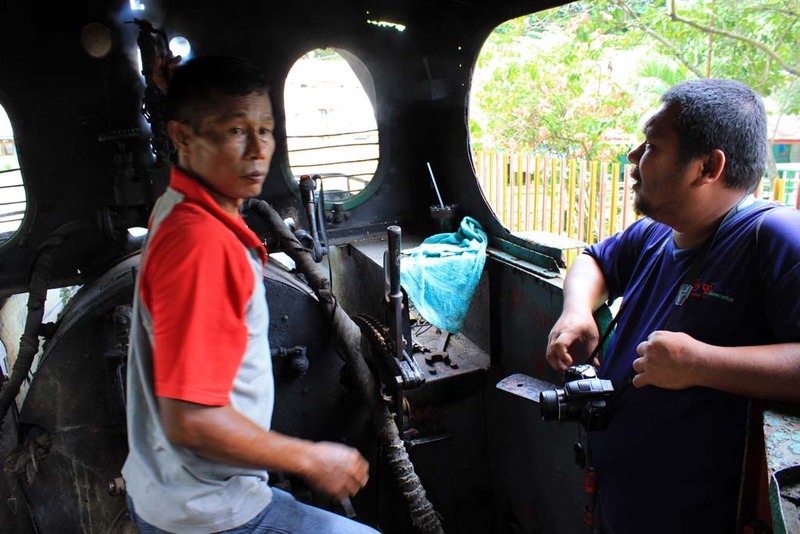 Ariawan Sulistya is my friend who is native of Karanganyar, and said that he grew up seeing Tasikmadu’s field lines action in his childhood days. His father once took the photo of the field lines action in this spot. Such photos are rare as very few people ever took the photo of Tasikmadu’s field lines action. It’s just pity that we couldn’t meet today as he had something else important to do. 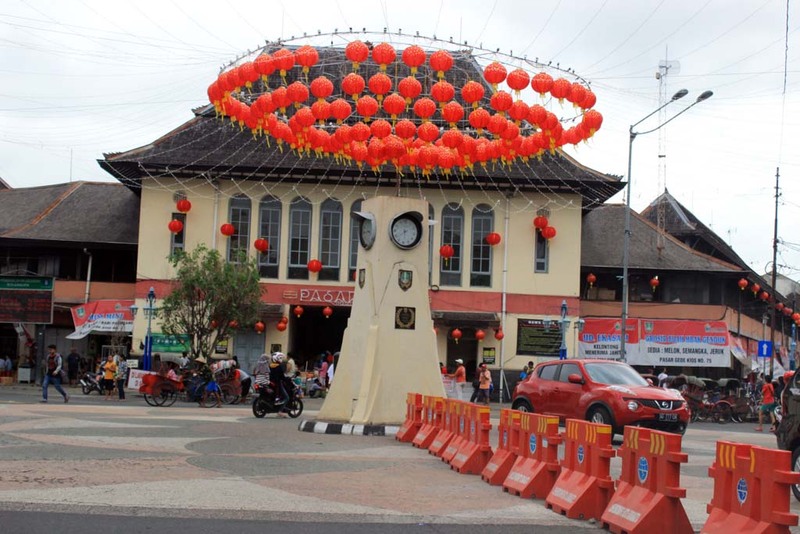 As soon as we returned back to Solo, Waktong wants to change some of his Malaysian Ringgits into Indonesian Rupiahs, as he began to running out of rupiah. We were looking for money changer around the city, but couldn’t find any. So as a last resort we had to go to the airport. 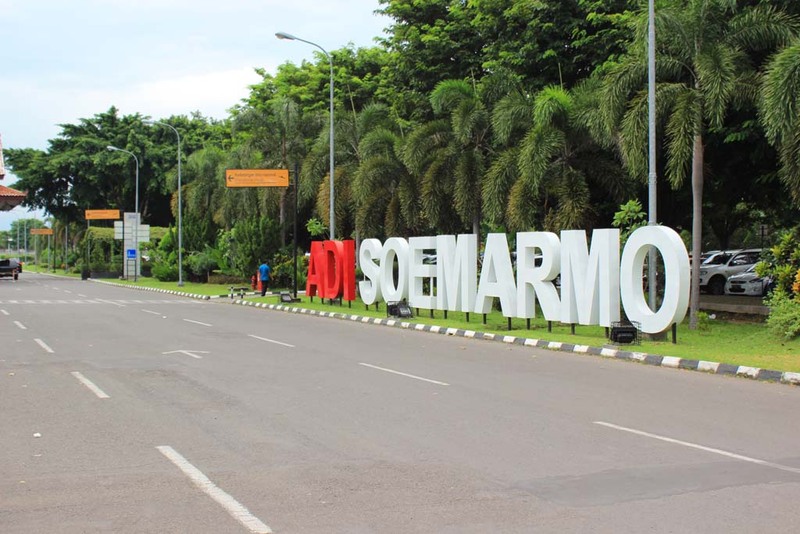 Adi Soemarmo airport is the main airport that serving the city of Surakarta. 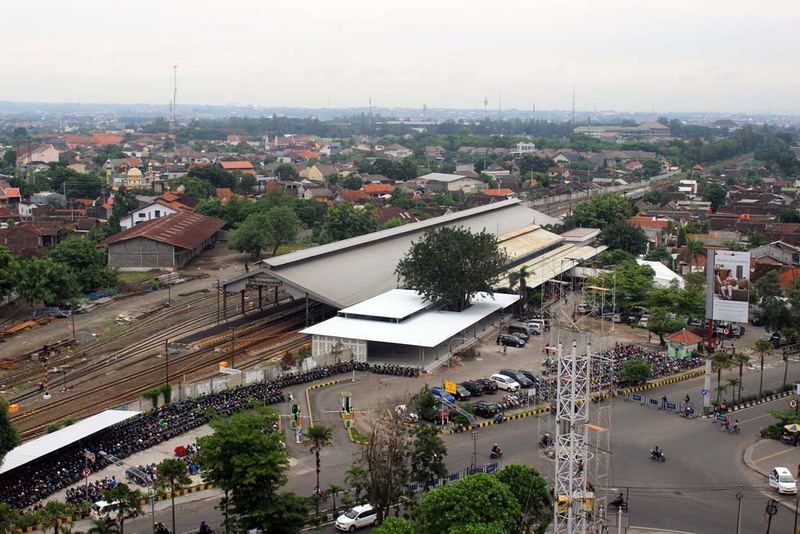 It is located to the north of the city. Despite of its rather small size and quiet atmosphere, it is actually capable of handling Boeing 747. When we were there, we saw strong presence of military personnel around. Some even carrying automatic rifles. 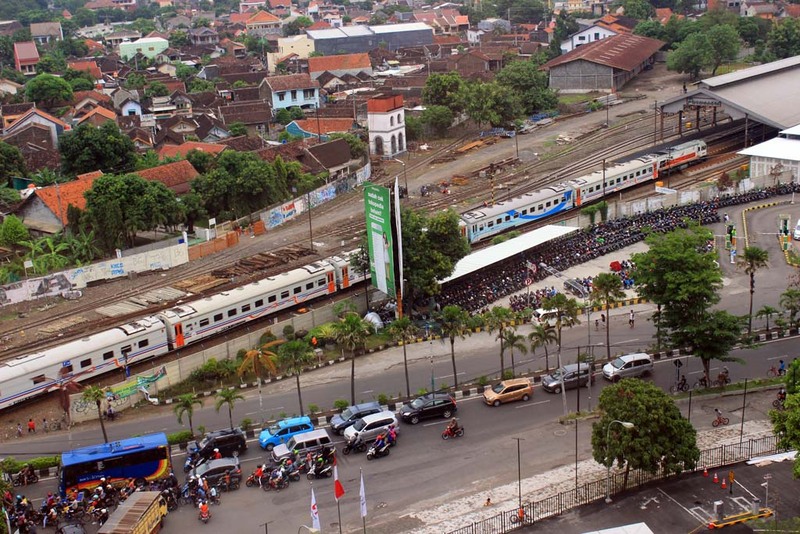 Apparently Mr. Jokowi, the famous former mayor of Solo which is now Indonesian president is visiting his hometown. 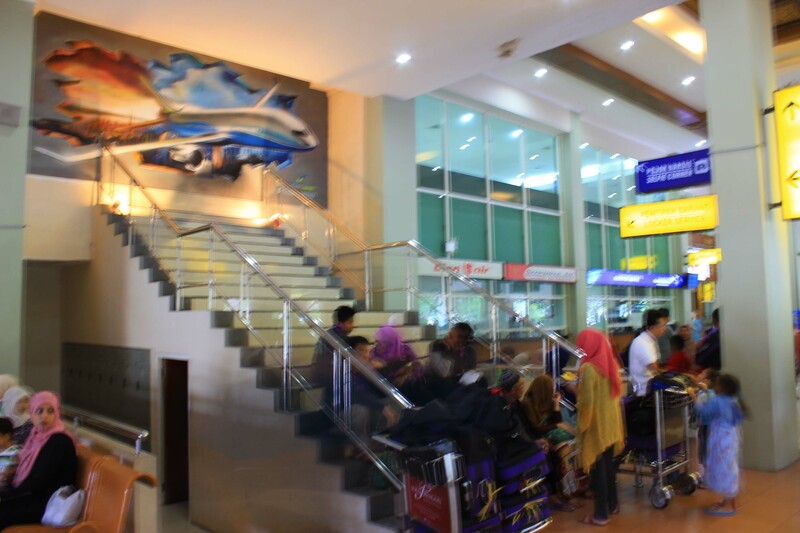 While Waktong and Hafizul changing their Ringgits, I walked around to see the airport the terminal. I found this amusing: why the stair leads to a wall? Were there any viewing hall where visitors could see the airplanes? Although opened in 2009, the terminal’s architectural design is akin to 1980s. 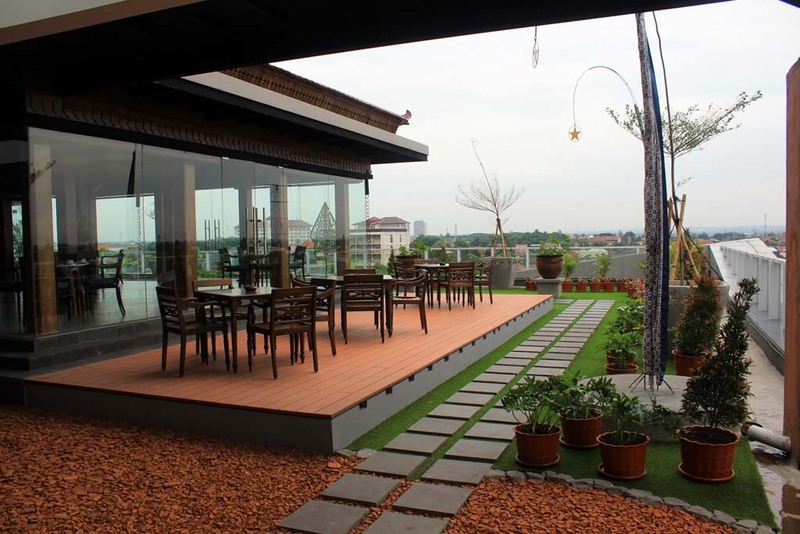 I know that they’re trying to incorporate Javanese element into the architecture. But somehow, it doesn’t work. 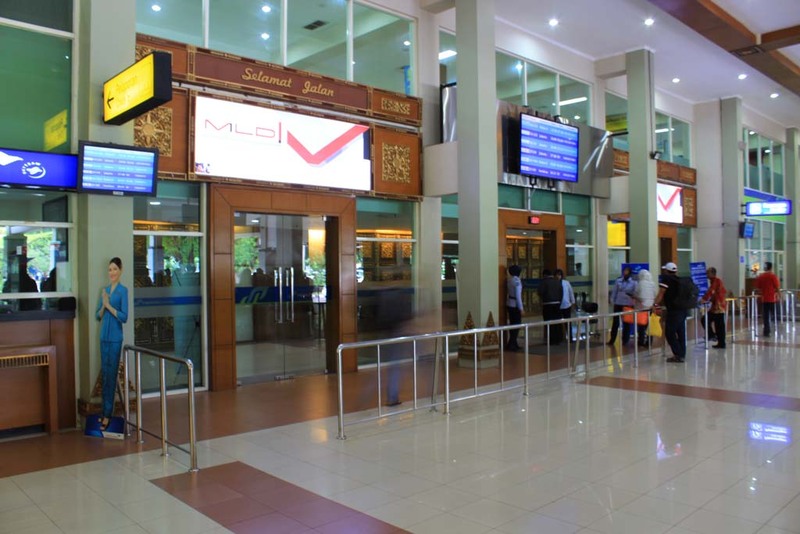 Despite of its shortcoming, overall the airport is good and perfectly managed. After settling the money changer matter, we returned back to the city. 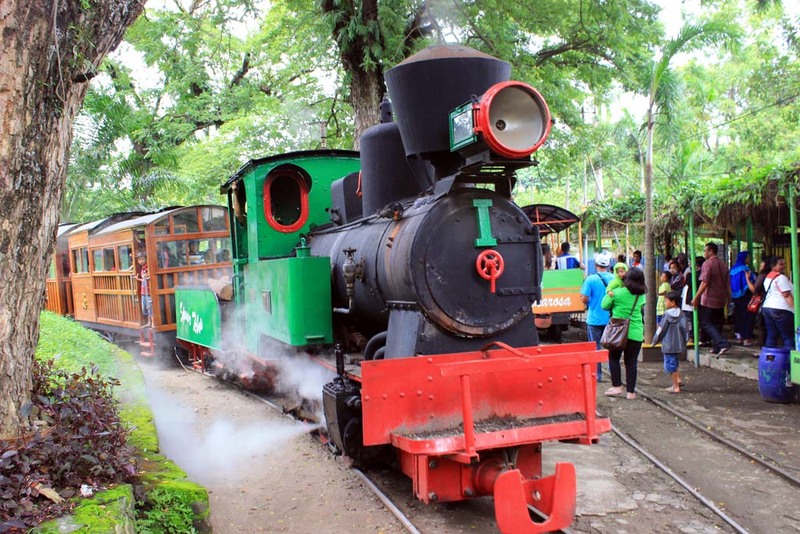 Along the way we came across this steam locomotive. 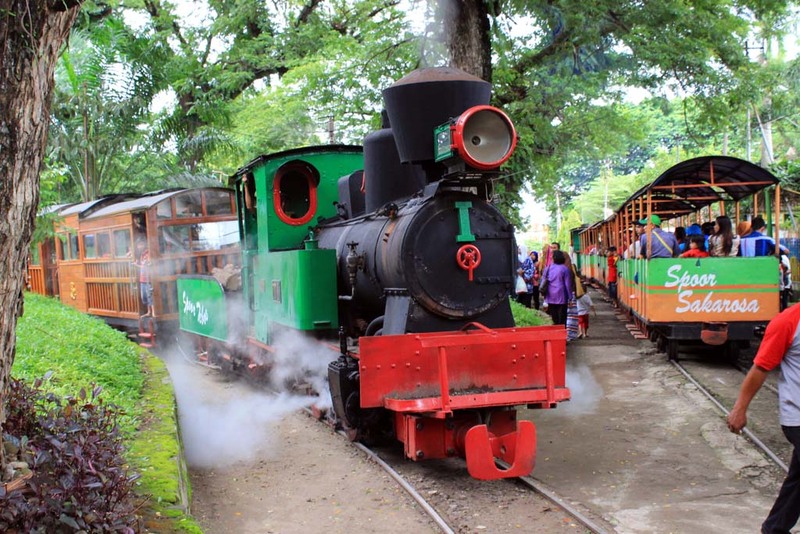 This locomotive was once part of Colomadu’s fleet of steam locomotives. 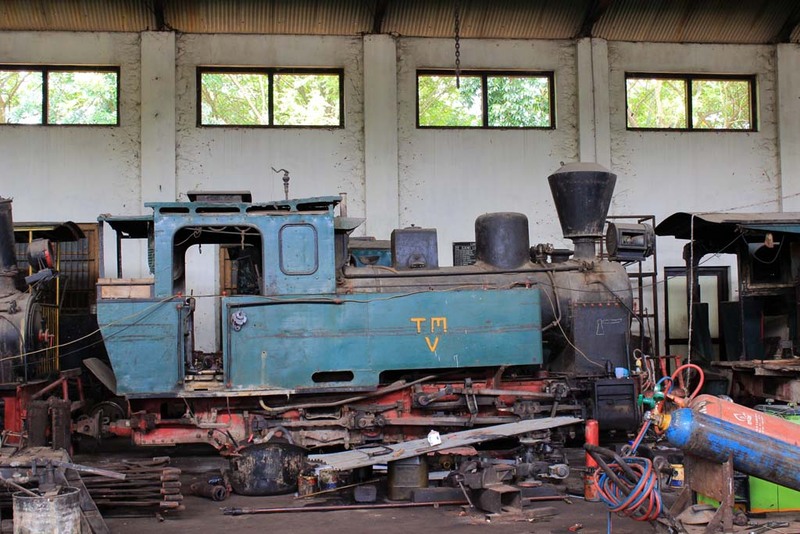 Since the mill’s closure in 1998, this locomotive has been in derelict state before being relocated to its current place. 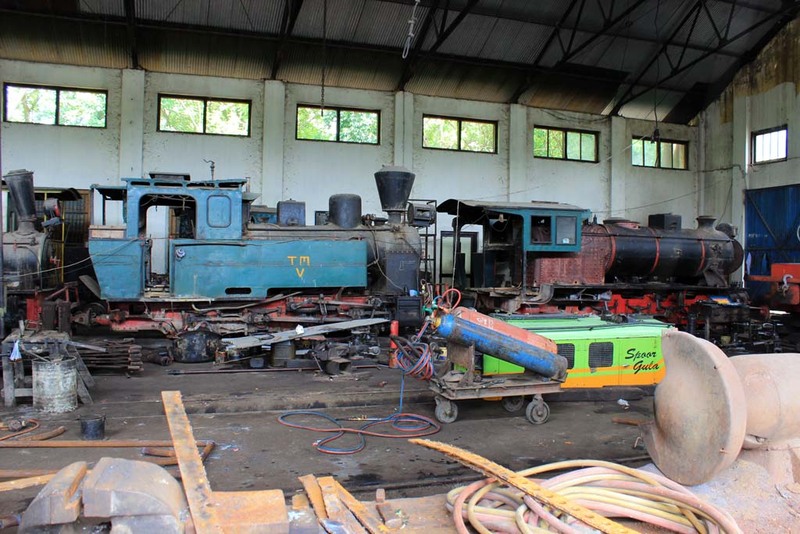 Judging by its appearance, I have a feeling that the cab and the boiler’s front cover are not original. 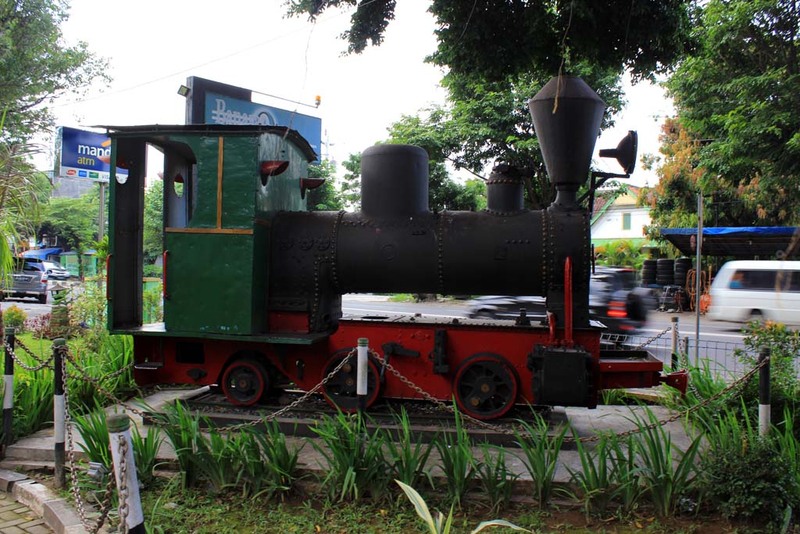 On our trip to the city center, we also taking picture of this old Orenstein & Koppel steam locomotive, displayed on pedestal in front of PTPN IX office. 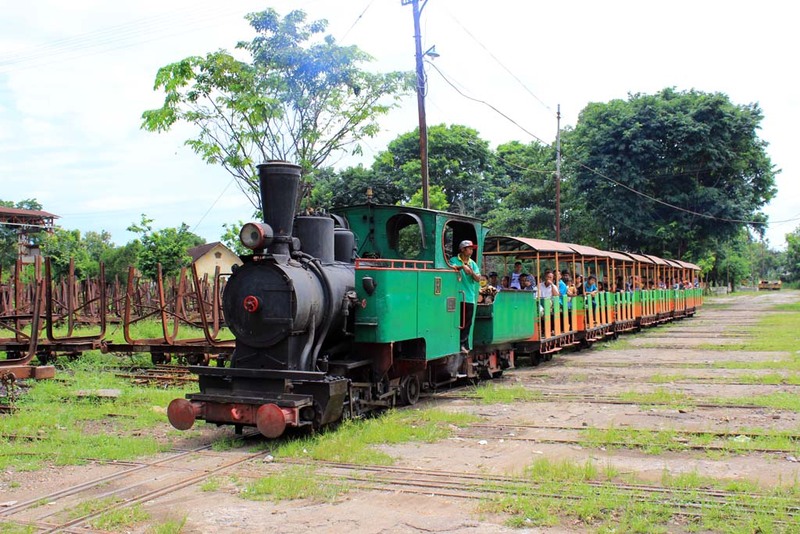 Named “Baletouri” this locomotive was built by Orenstein & Koppel, and it was originally part of Kalibagor sugar mill fleet. 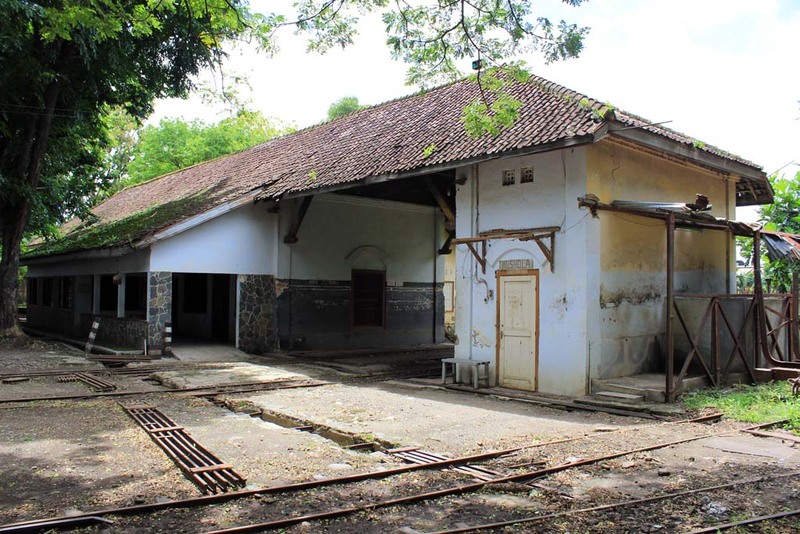 But when the mill closed, it was relocated to Gondang Baru mill before being preserved here. We felt hungry because we haven’t had lunch. 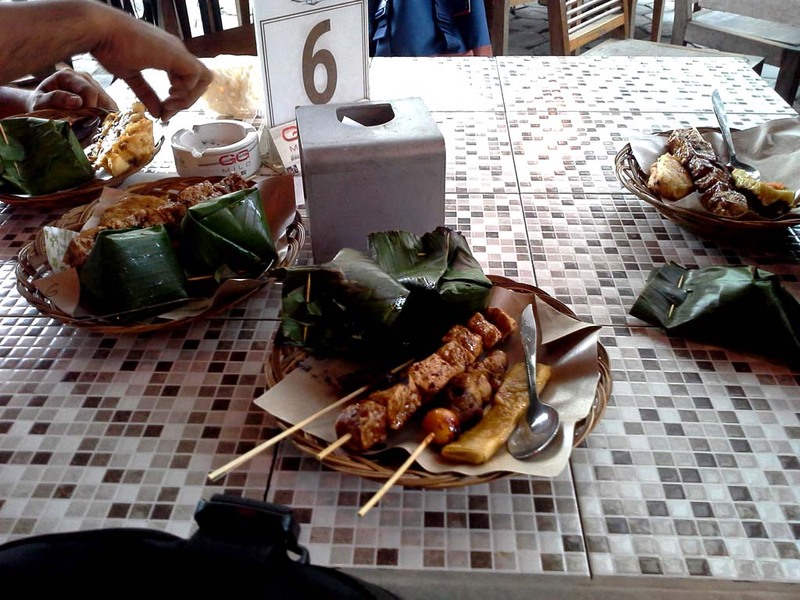 So we are asking suggestion from the driver about the nicest eating place in Solo. 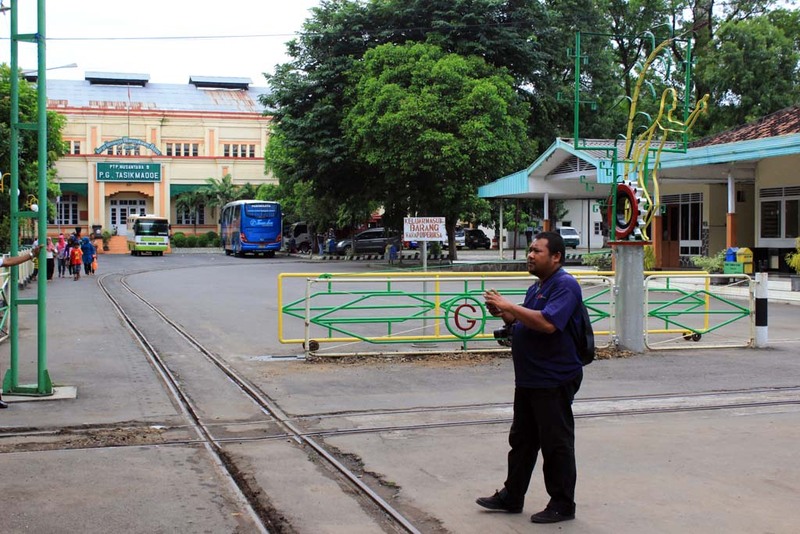 He directed us to Tiga Tjeret restaurant which is located right next to Mangkunegaran royal palace. 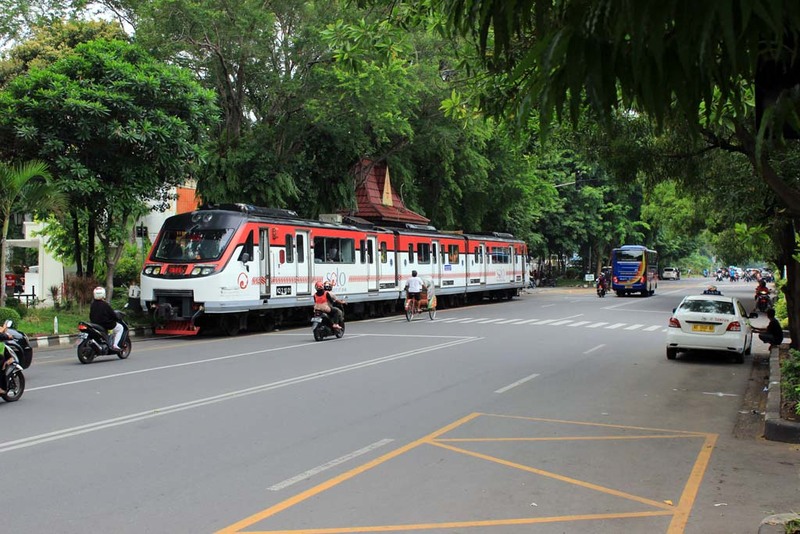 The driver said that it is owned by the eldest son of president Jokowi,(although some of my friend later disputed the claim). 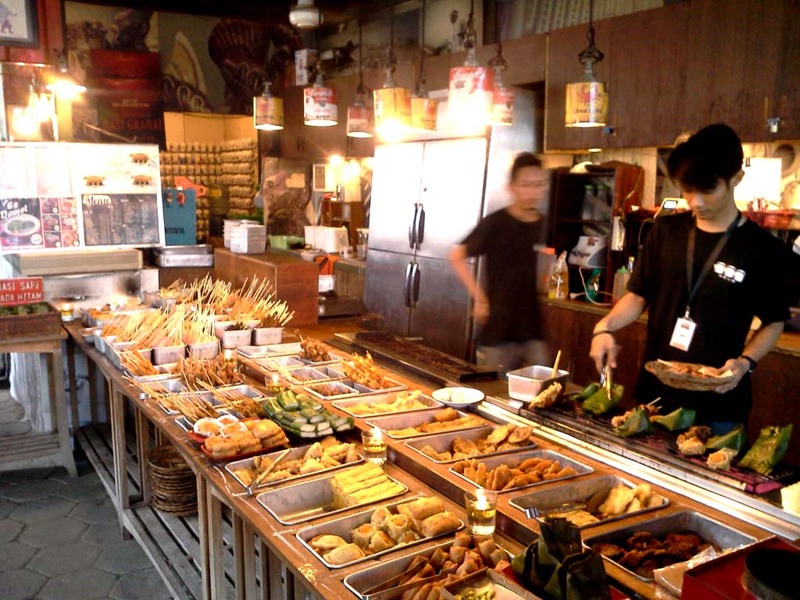 It sells traditional “angkringan” Central Javanese food. 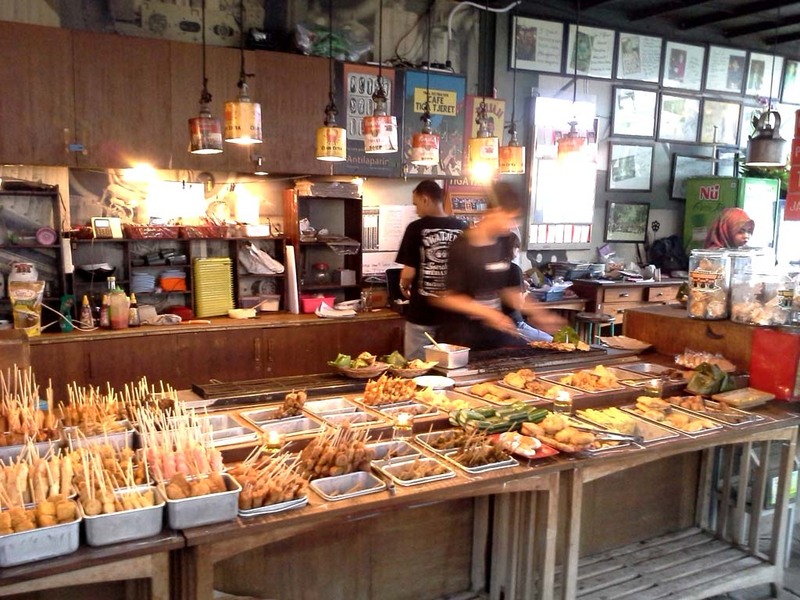 The food menu was originally a lower middle class ones, but polished to make it appealing to upper middle class. Even the rice has many varieties of flavor, with bombastic naming. Whatever we ordered, it will be heated on grill on the counter. The taste of the food is excellent. The atmosphere is also great. 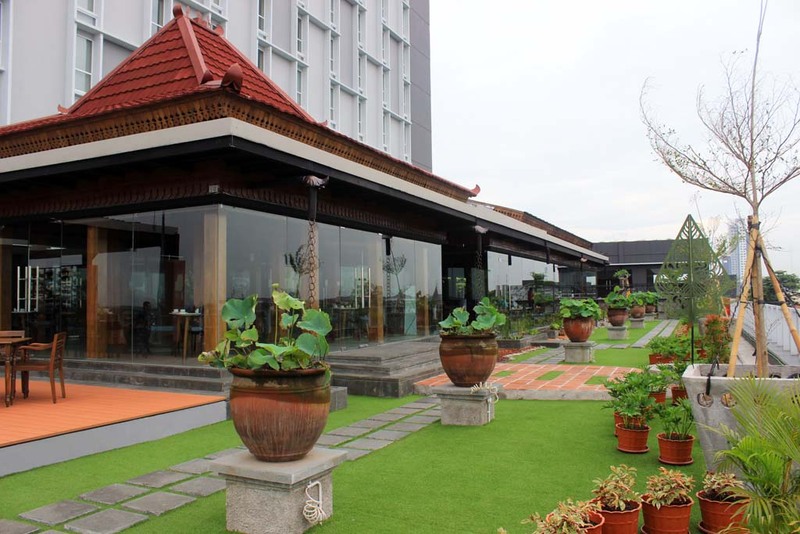 After finishing our lunch we returned back to our hotel for rest and relax, and also bade farewell to our driver and thanked for all of his effort in showing us around. Generally, today’s itinerary have been completed and the remainder of the day are free. Waktong and Hafizul decided to spend the evening on their own, while I choose to take some rest in my room and wait until my camera battery fully charged. Once it is fully charged, it’s time to get something to eat. 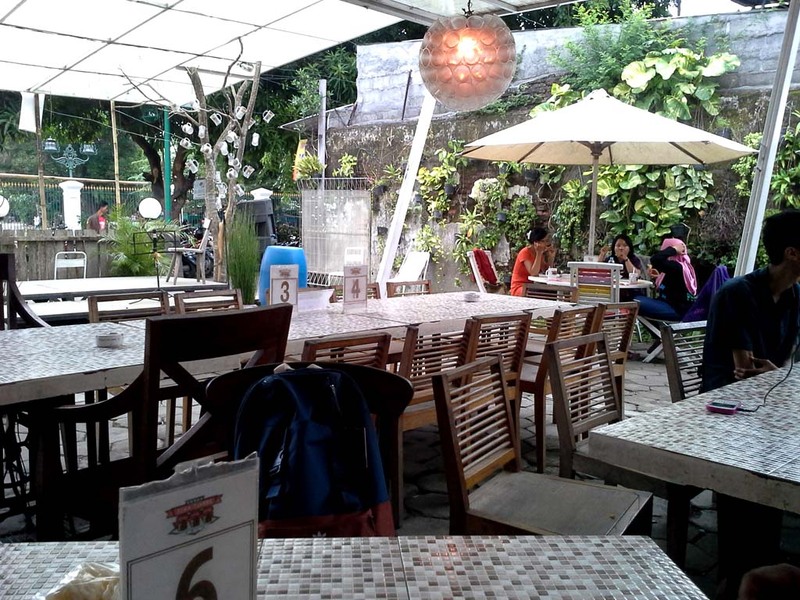 My friend, Ariawan Sulistia, had actually suggesting several places to me. 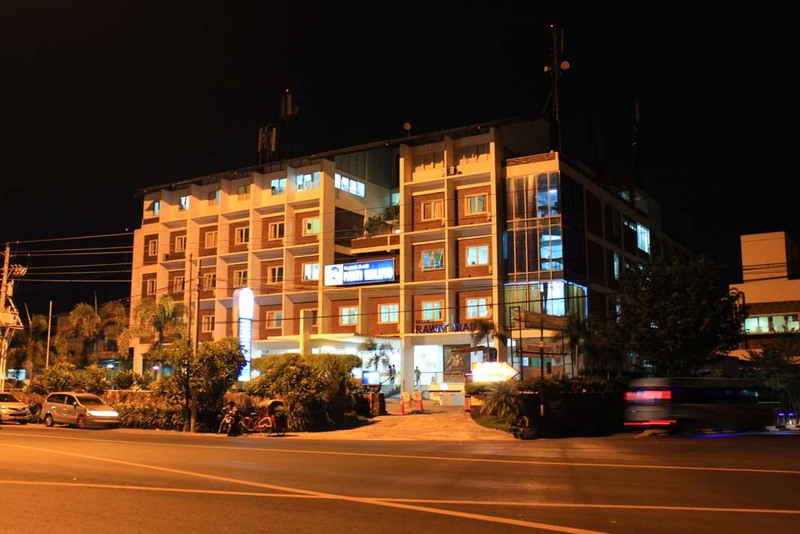 And all are located near the hotel. 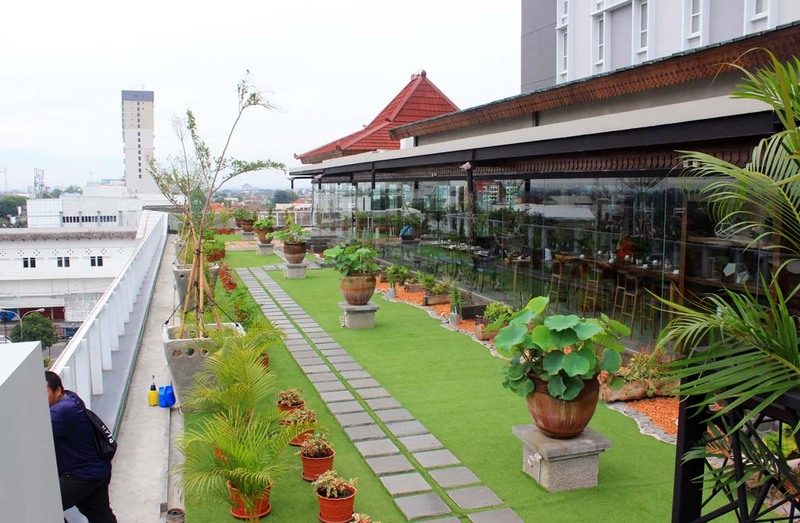 I picked Bestik Pak Mangun, which is located south east of the hotel. It’s a long walk to there. 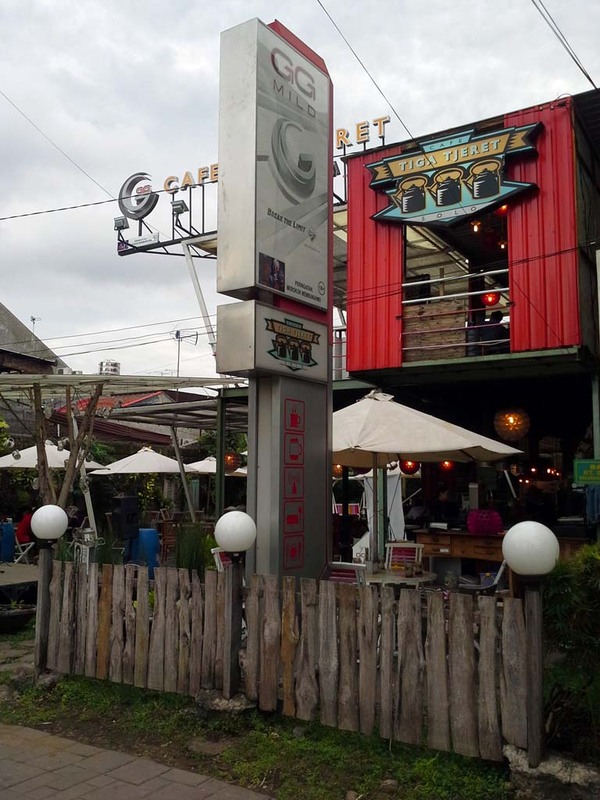 And upon arriving, I found the rather shabby looking restaurant, served by sour faced servants. 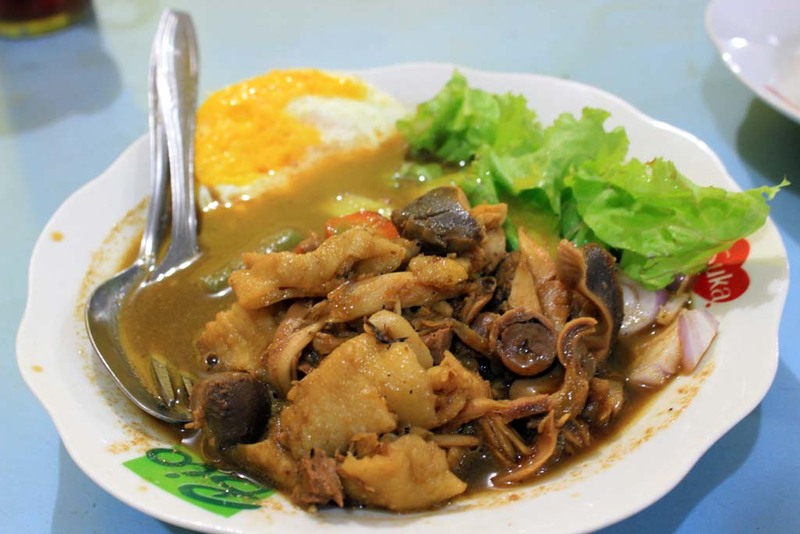 When the food served, I was quite surprised to find that it is pretty much a stewed chicken, served with fried potato. If that’s not enough, when I paid for the food, apparently there are some hidden costs which make me a bit upset. I give the mark for appearance: 6, taste: 6, service: 4. Not worth visiting the place again. 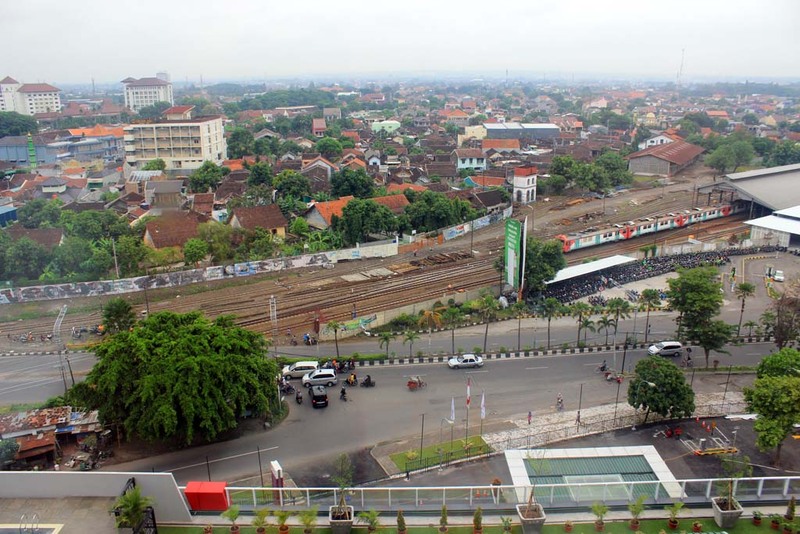 From there I walk to Solo Square to buy something in its supermarket. Apparently it is a very long walk from the restaurant, and I also had to cross the railway track too. Aong the way I caught the glimpse of Panti Waluyo hospital with its unique architecture. 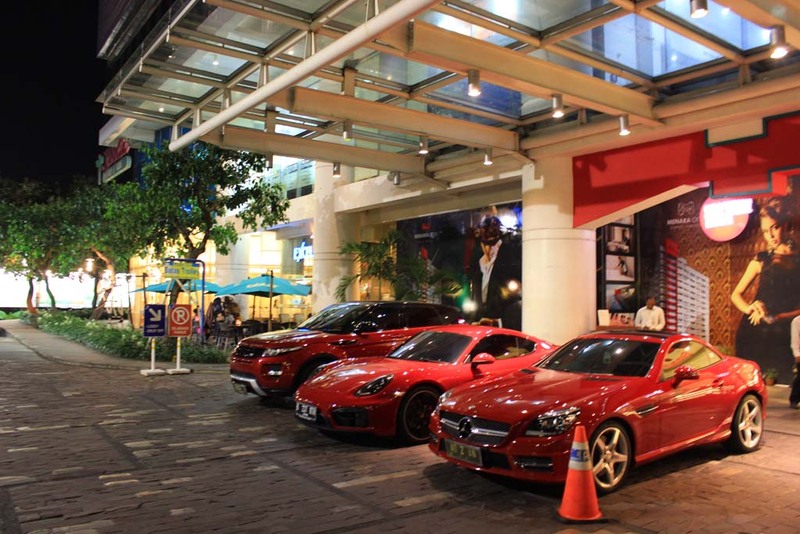 It’s quite a busy time at Solo Square, and apparently there are some fancy cars being displayed in front of it. 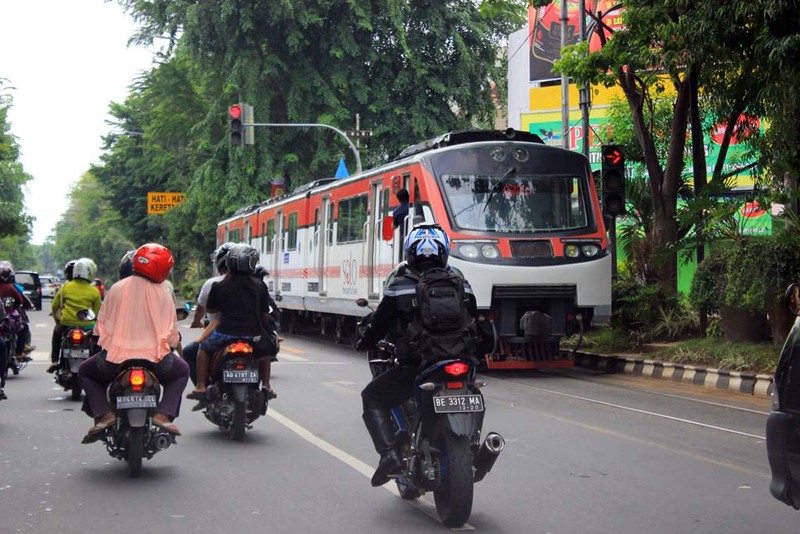 All of them have Jakarta number plates. 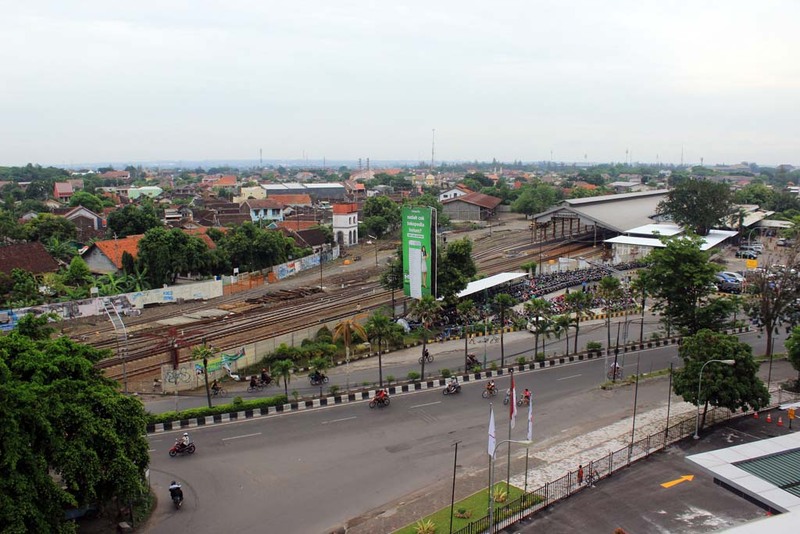 After buying some drinks and snacks that I need, I walk back to my hotel for overnight rest, passing through a quiet looking Solo Purwosari station.